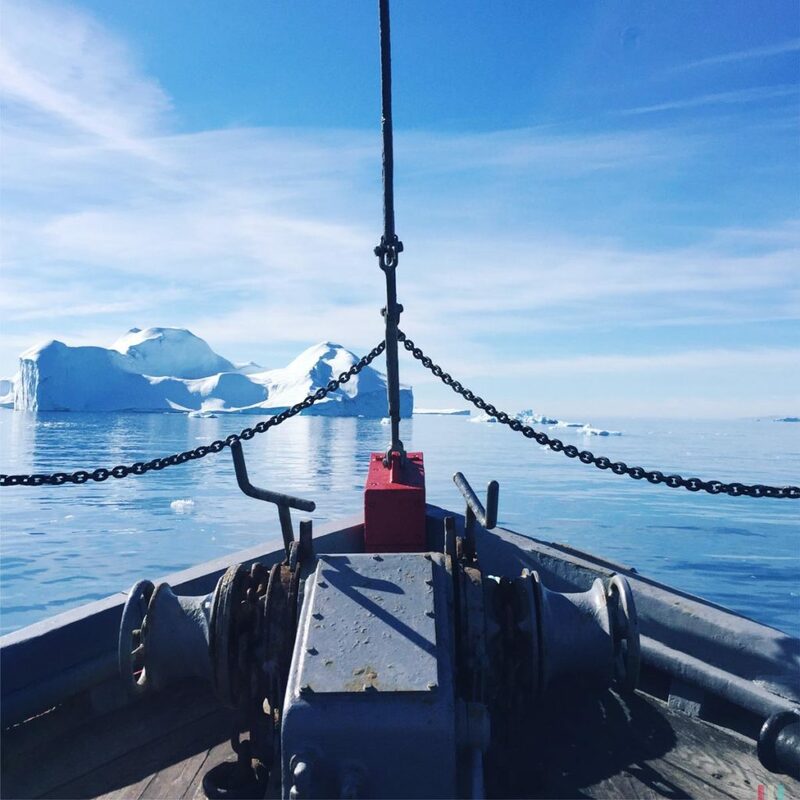 Endless ice, giant icebergs, midnight sun and plenty of whales: A summer whale trip to Greenland. 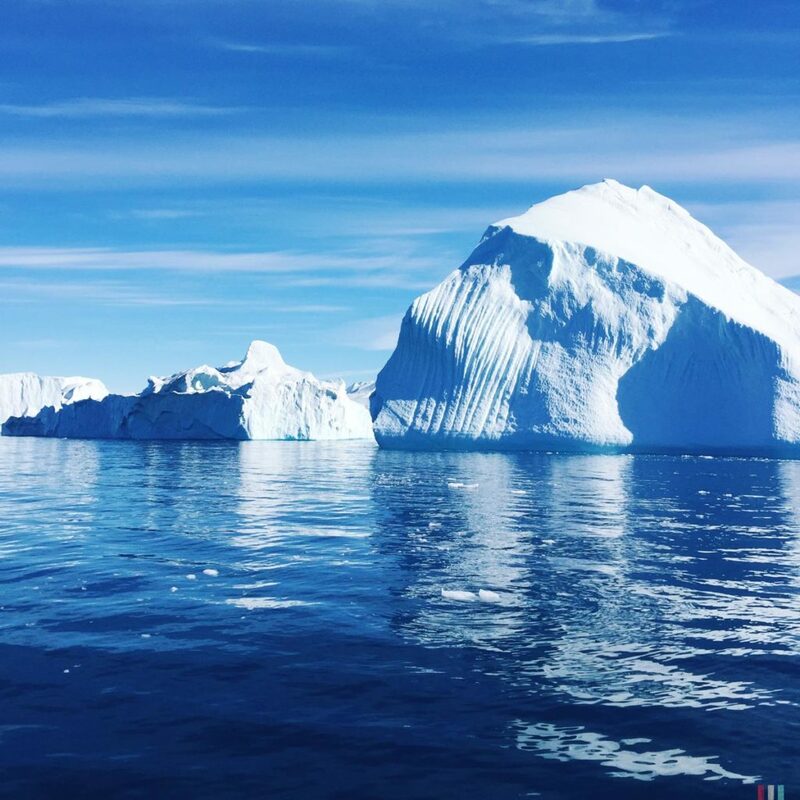 Endless ice, giant icebergs, midnight sun and plenty of whales: Hello, Greenland! 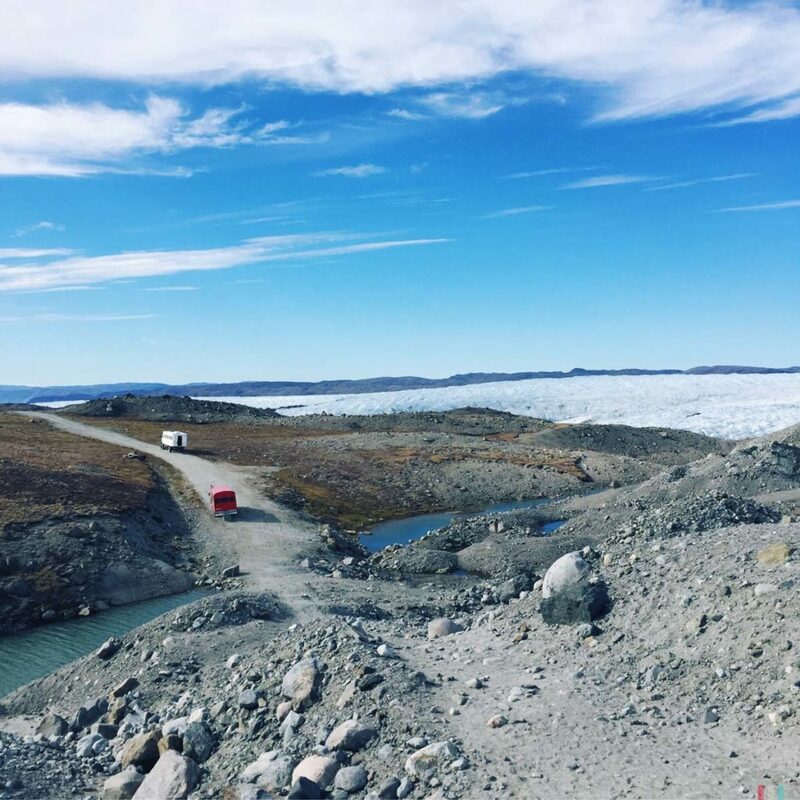 The trail to the Ilulissat Icefjord, where thousands of icebergs are stacking and piling up. A giant icy traffic jam. So, I told her about the giant icebergs. She asked how cold it’s going to be. I talked about the endless ice sheet. She wanted to know if they have roads there. I mentioned the surreal landscapes and great hiking trails. She reminded me of the polar bears. I brought up the whales and the Inuit. She stated that the Inuit are eating the whales. 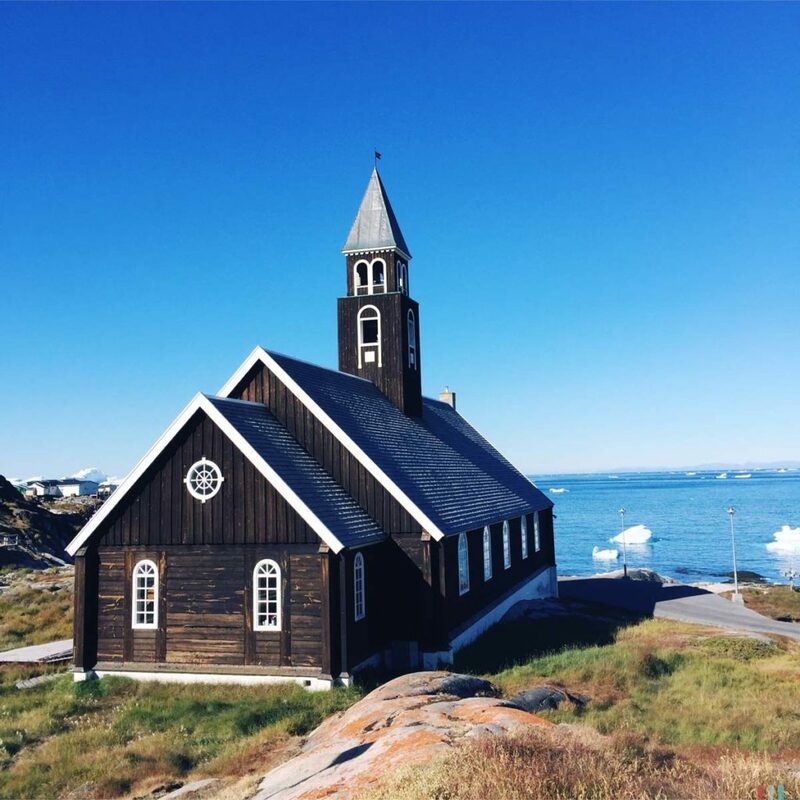 Greenland is perfectly tempered in summer, during daytime you’ll have 5 to 10 degrees, at night it’s between 0 and -10 degrees. Not too chilly at all. 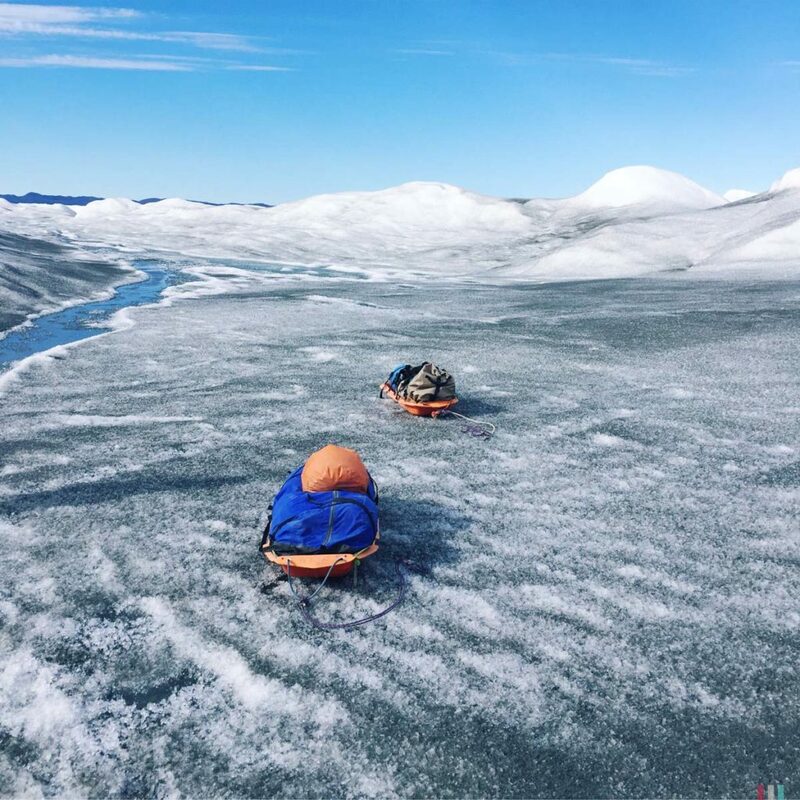 Yes, they do have some roads in Greenland, but certainly not outside the settlements – but who would need streets if there’s boats, snow scooters and dogsleds? Polar bears live far in the north and won’t be strolling around in the south. Okay, if they get stuck on some floating ice drifting south … – but that’s really not going to happen. And true, Inuit do eat whales. But it wasn’t the Inuit who nearly wiped out all the whales in the world via industrial whaling, right? 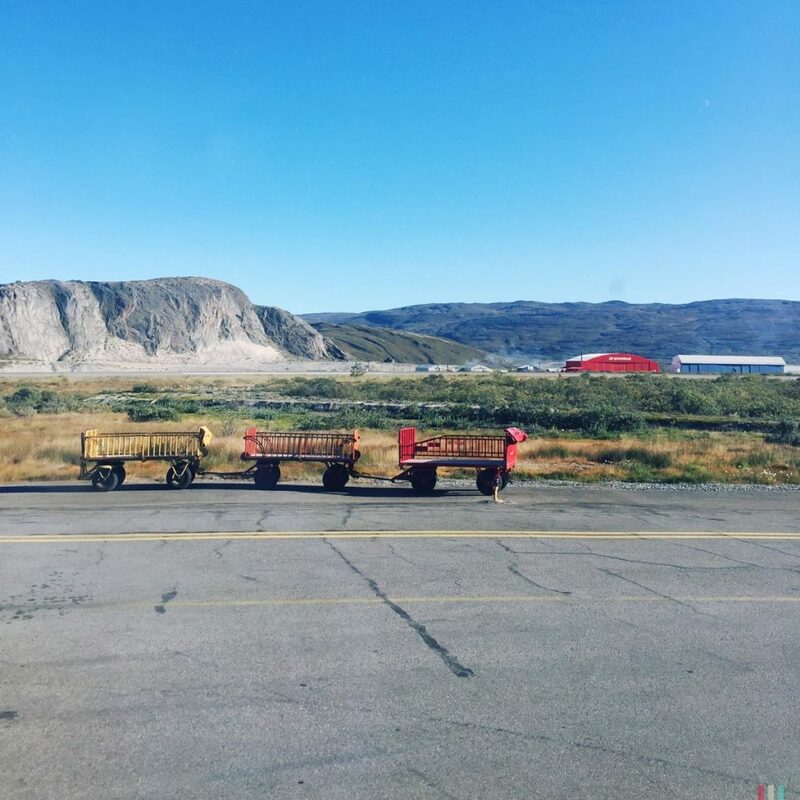 Rush hour at Kangerlussuaq airport. Colored cabins at the Old Camp. Meeting the locals: a snow hare. Waiting for the winter: snow scooters. Lazy afternoon at the Old Camp. Glacier lakes on the ice sheet. 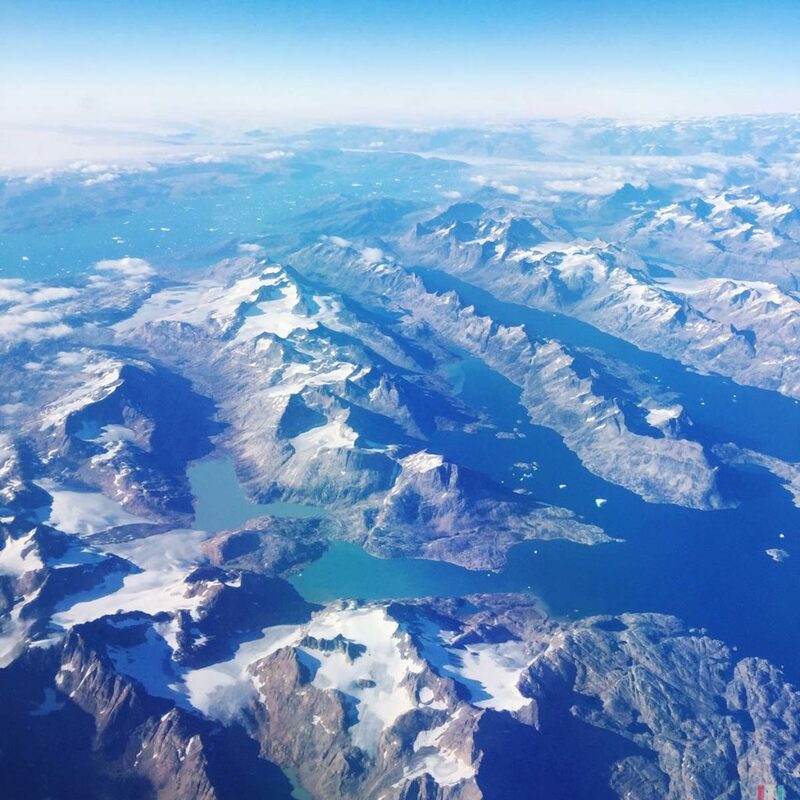 Also, I really really really wanted to visit Greenland for quite some time now. 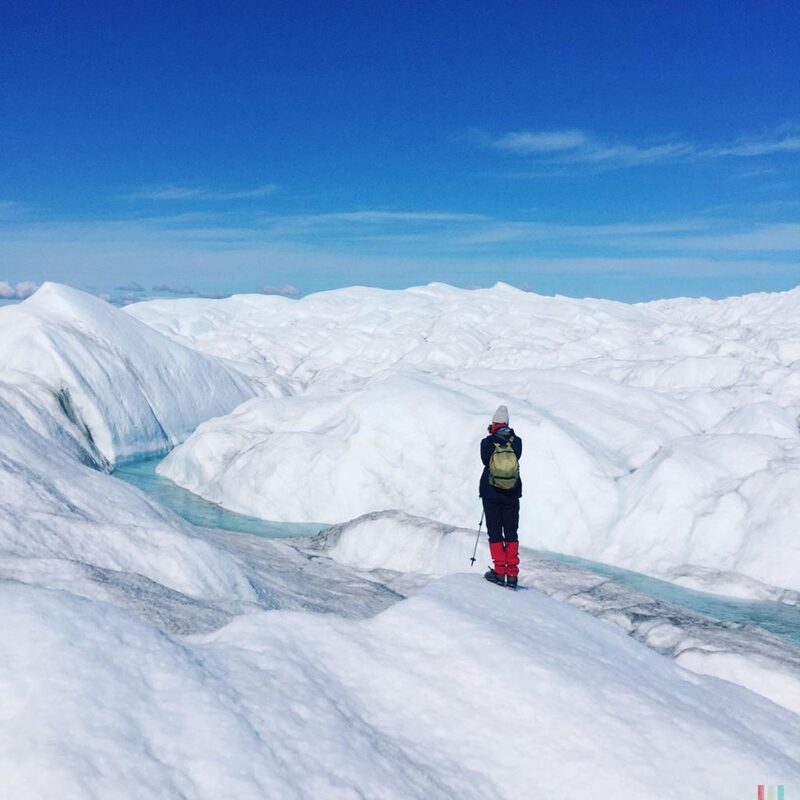 On one of our recent travels we’d met some guys from Norway showing us some stunning pictures from their summer trip to Greenland. And those pictures got me. Since then, I wanted to go to Greenland. Theresa liked the pictures, too, but in total she wasn’t as enthusiastic (or: mad?) about Greenland as I was. Thankfully she still agreed in having a closer look on Greenland. And the icebergs. And the whales. 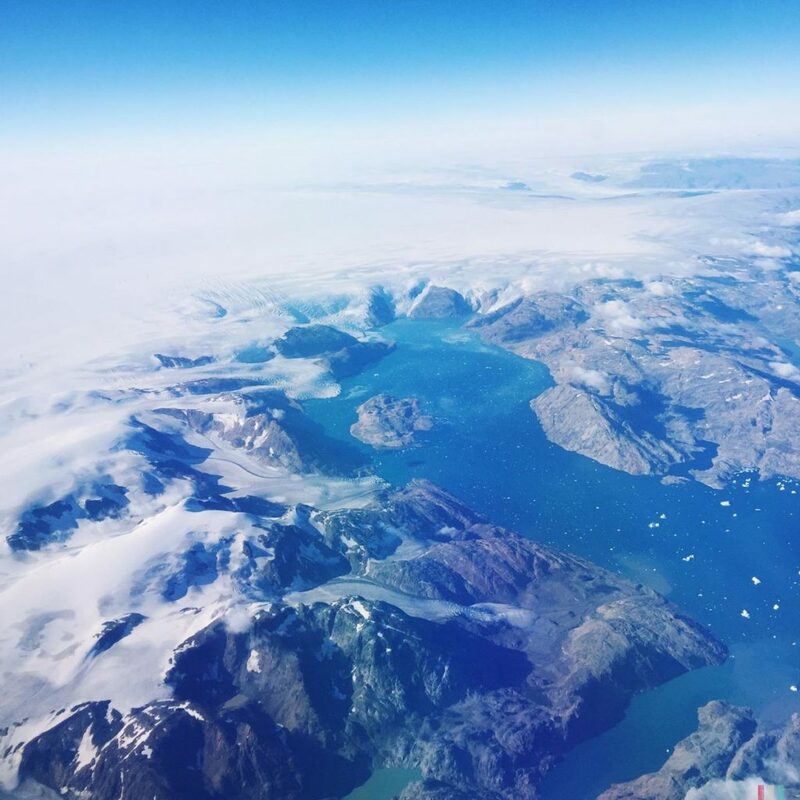 Hello, Greenland! Hello, summer! The endless ice sheet. It covers about 80 percent of the country and is up to 3 kilometers thick. 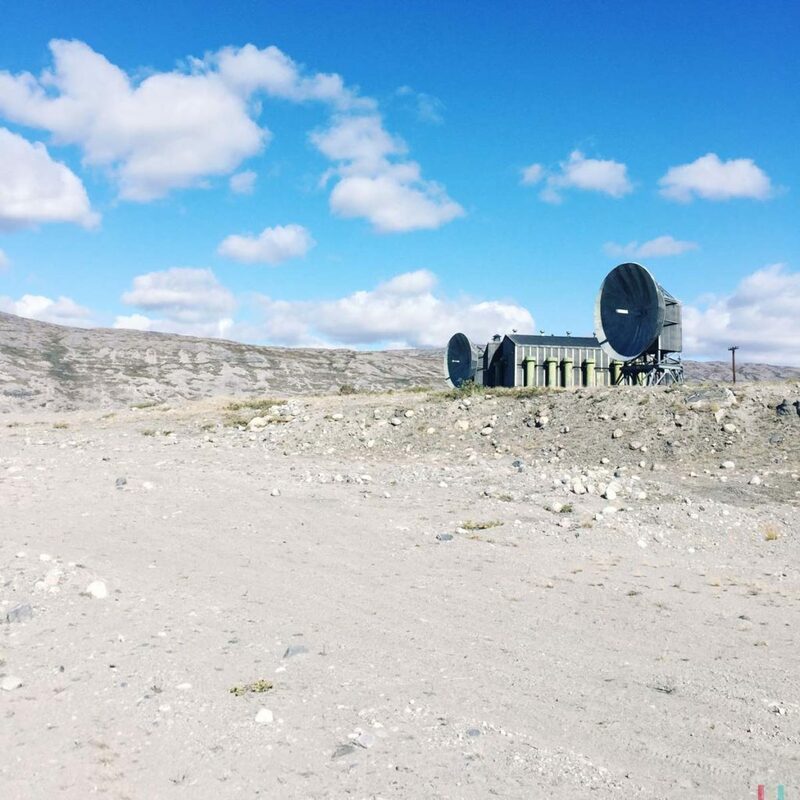 Kangerlussuaq. Most people come here only to change planes. We decided to stay for a couple of days. 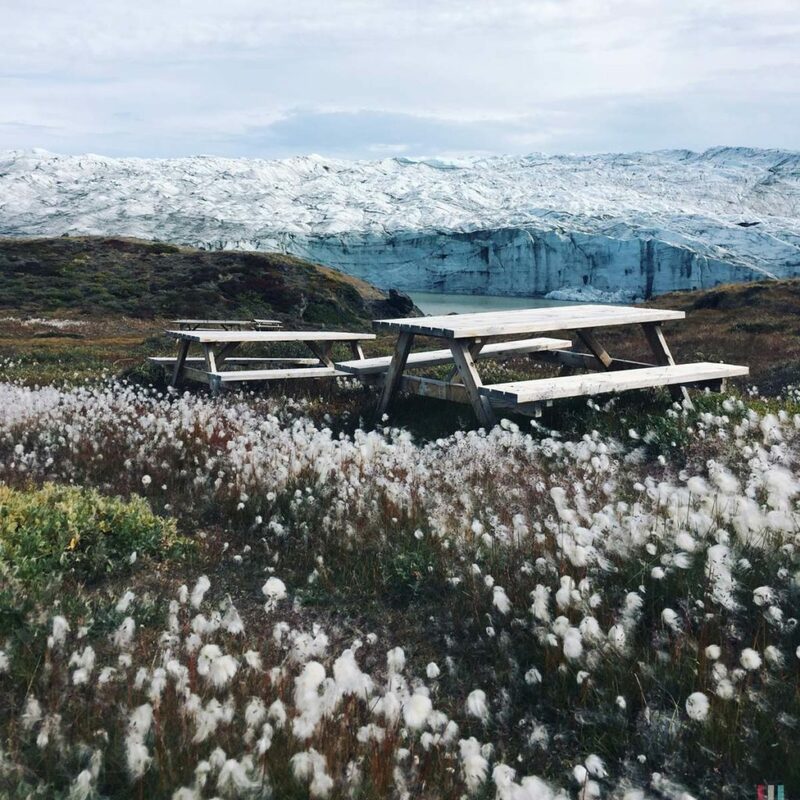 If you’re going to Greenland, you’re going to Kangerlussuaq. This is the only airport big enough to handle the large European planes. An old US airbase. 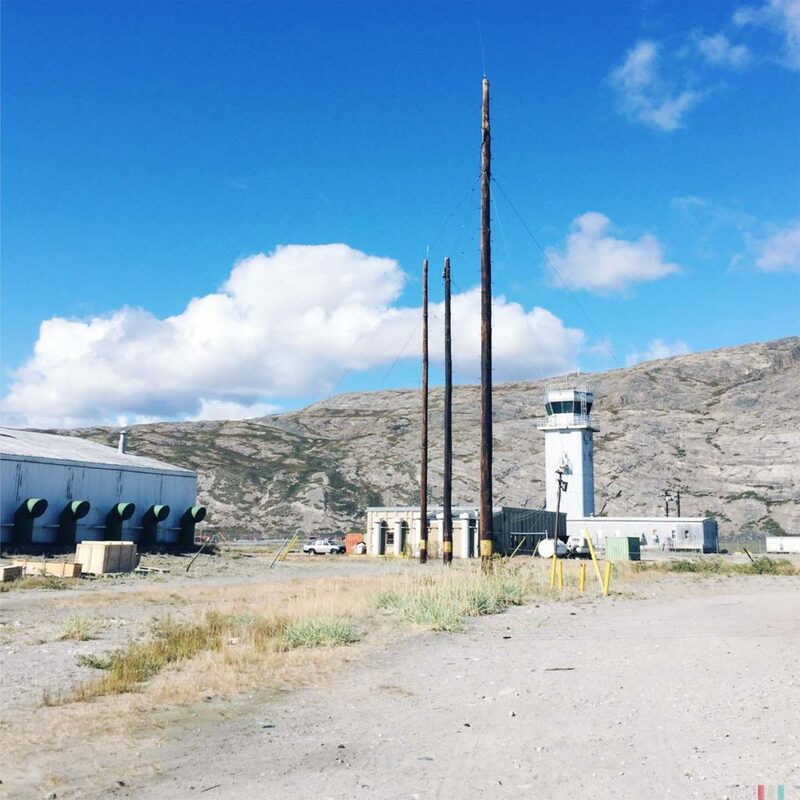 Except the landing strip, there’s little to see in Kangerlussuaq. 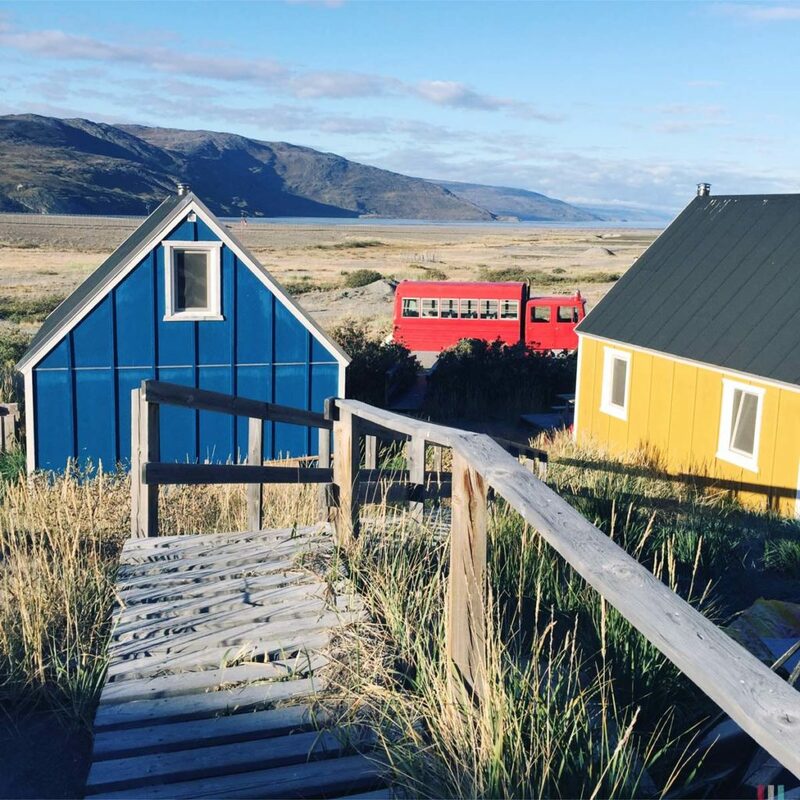 Some beautifully colored cabins, snow scooters in the sand, every now and then a plane. 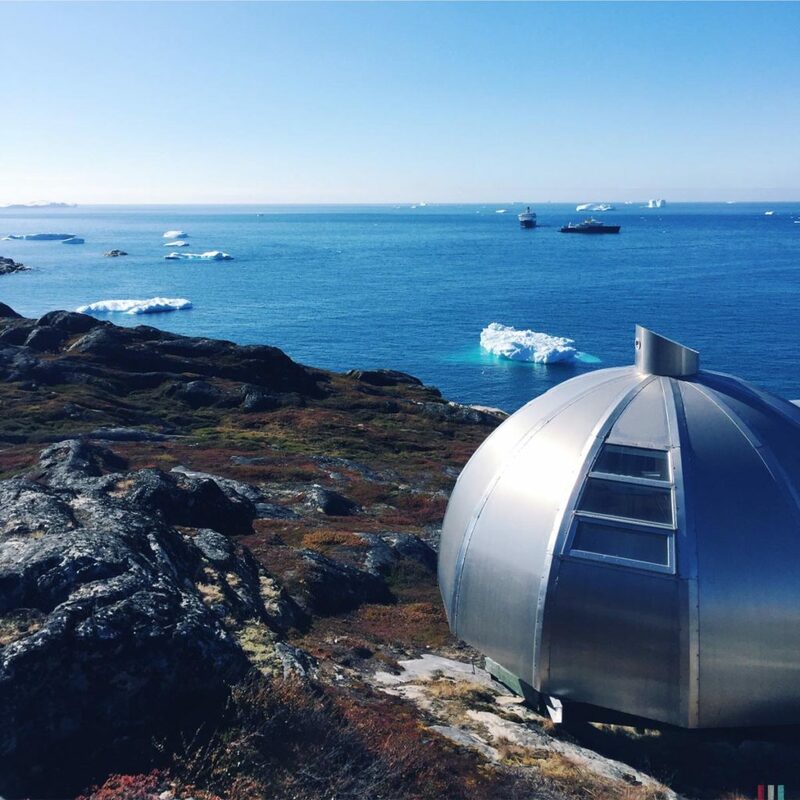 18 degrees, 18 hours of sun, all silent, total remote. Wild wild west. 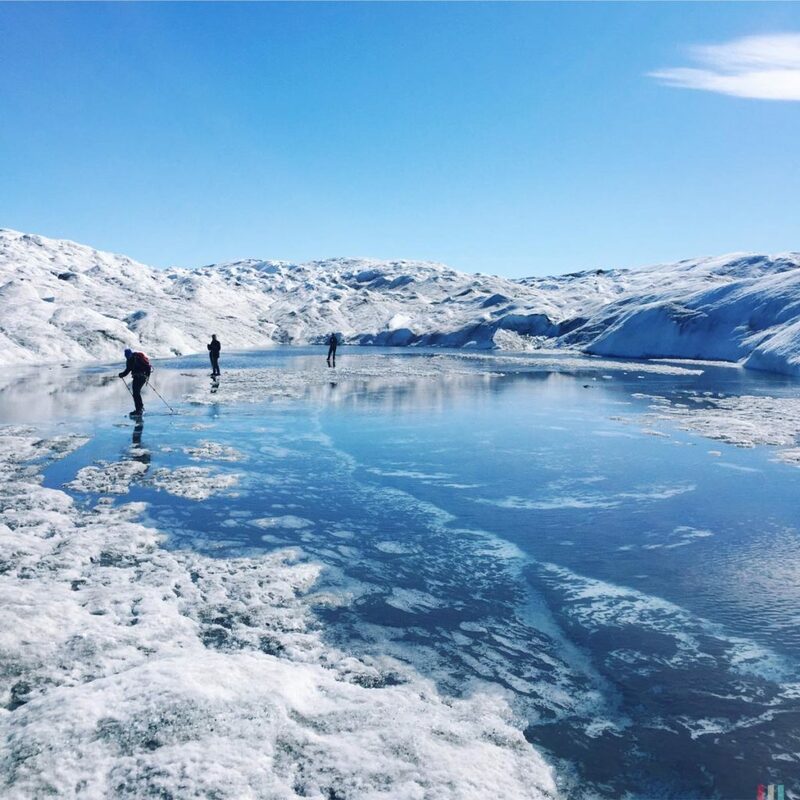 From Kangerlussuaq you’ll have the best access to the ice sheet: a long sandy path, 40 kilometers, the only »road« in Greenland outside of a settlement. All you need is a 4WD, about three hours of time – and quite a robust belly. It’s rocking and rolling like being on a ship in bumpy seas, and it’s surely no shame to get a bit sea sick during that ride. But still: it’s the easiest access to the ice sheet. 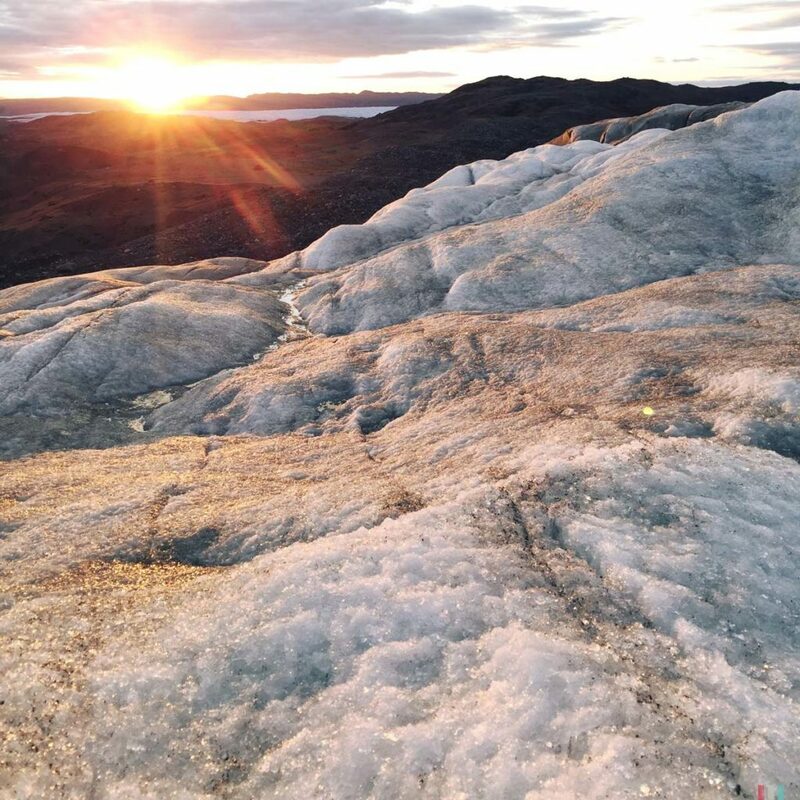 The Greenlandic ice sheet is covering about 80 percent of the country. After Antarctica this is the largest ice shield in the world: 2.500 kilometers long, 1.100 kilometers wide, up to 3 kilometers thick. If this ice would melt due to climate change, the sea level would rise by seven to eight meters. Seven to eight meters! So much ice! 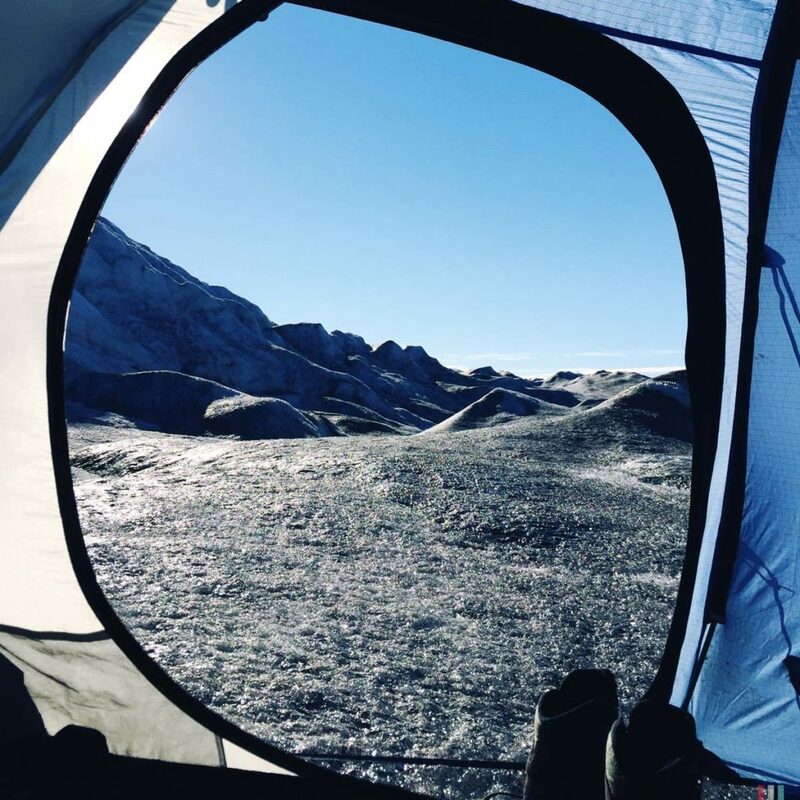 Our tent on the ice sheet. The edge of the glacier. The tastiest drinking water in the world. Evenings at the ice sheet. The Norwegian polar explorer Fridtjof Nansen was the first to cross the ice sheet. He succeeded in 1888 after 40 days of skiing and freezing. We decided to follow his steps from our position. 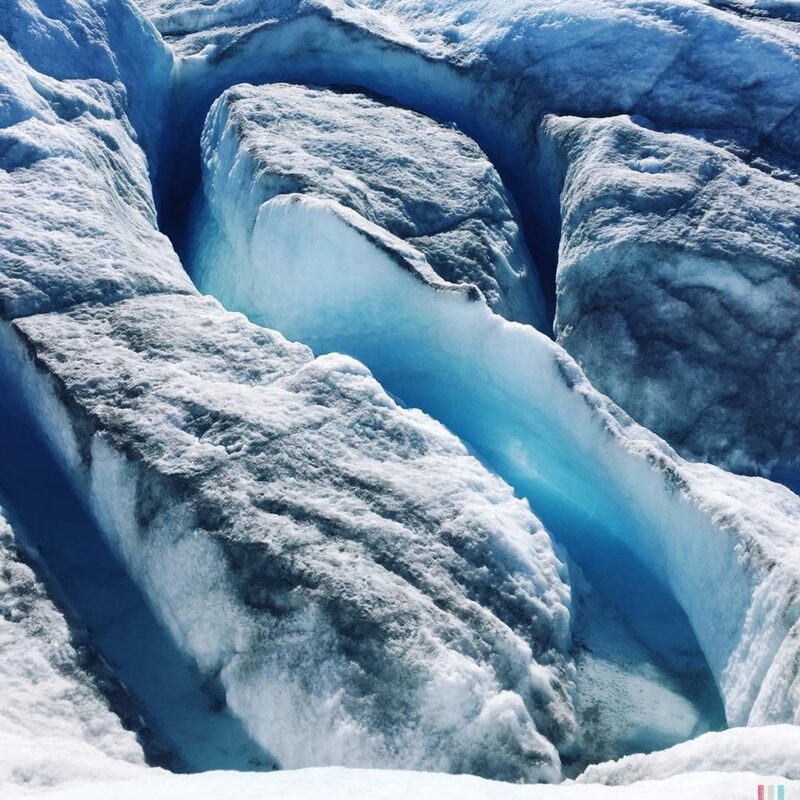 The ice sheet is surrounded by a huge glacier belt. 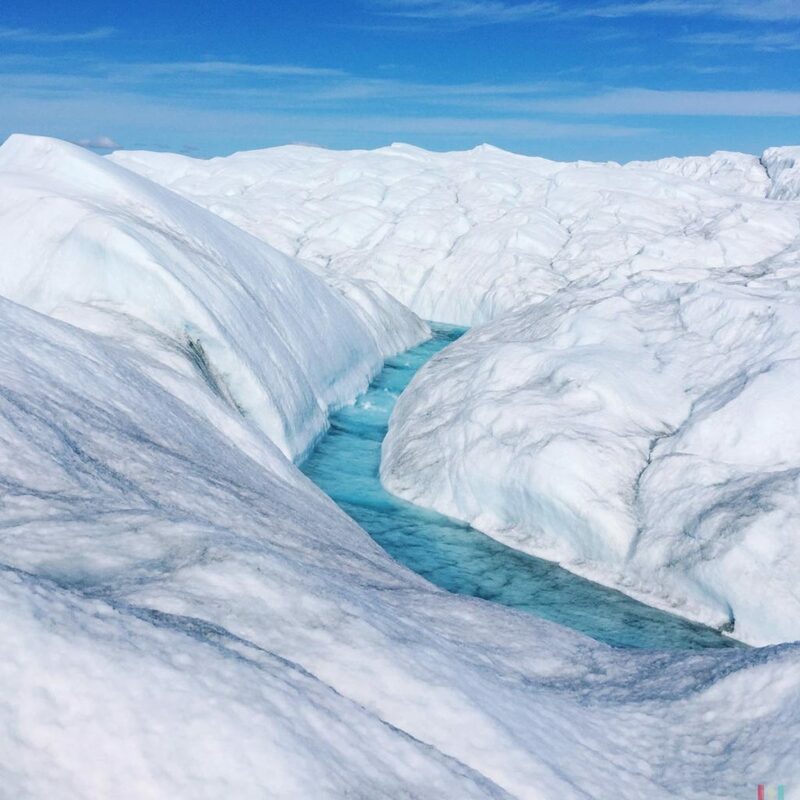 There’s thousands of glaciers in Greenland, draining the enormous loads of ice into the ocean, producing millions of giant icebergs. And this glacier belt is an incredible area for hiking. 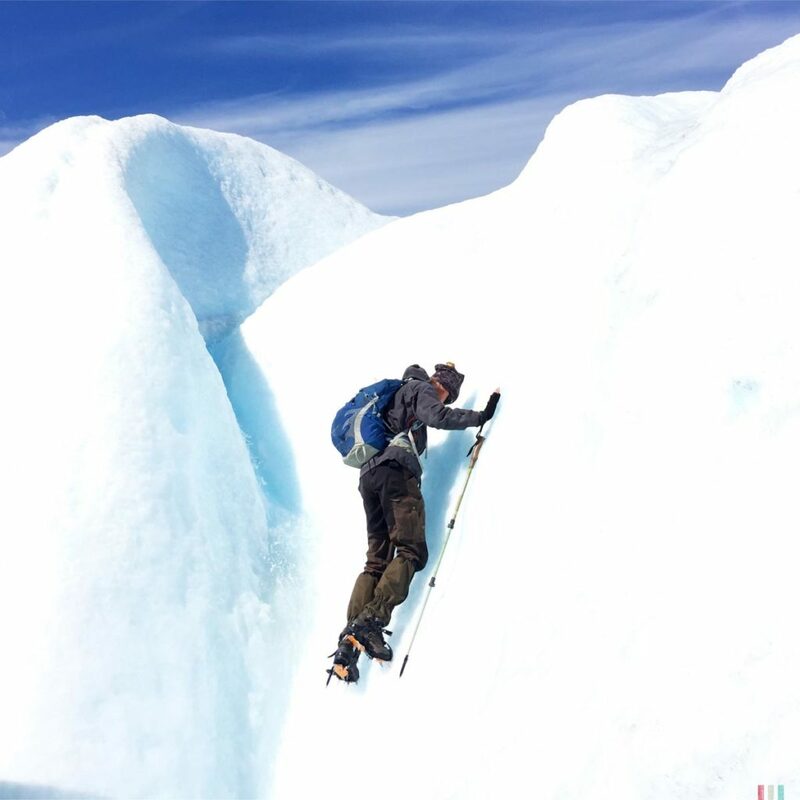 So, we found a guide and joined a small group of ice sheet hikers and got ourselves on the ice for two days. 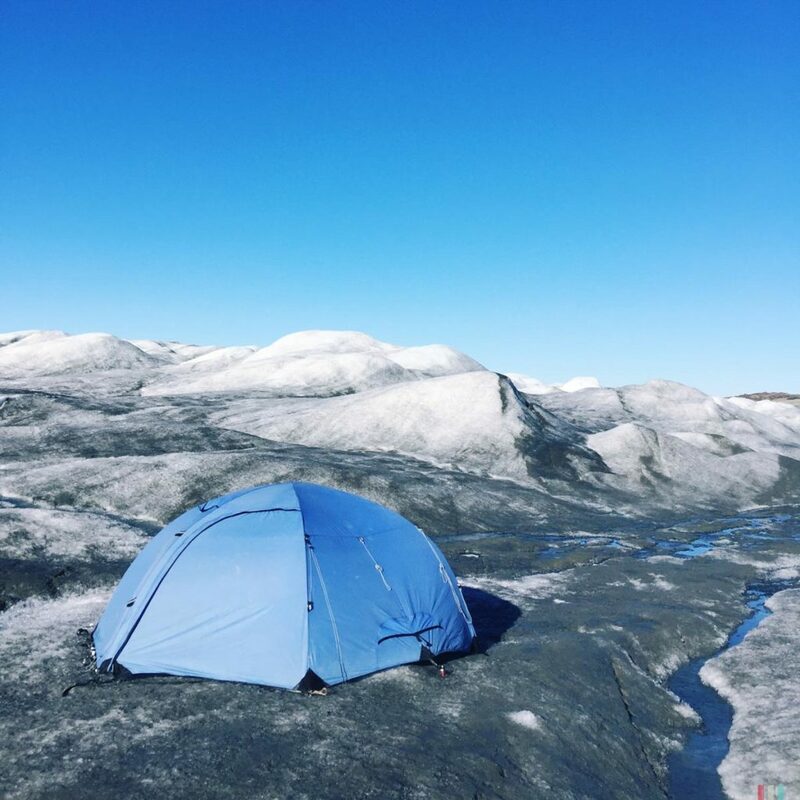 Camping on the ice included! Two days of feeling like a polar explorer! 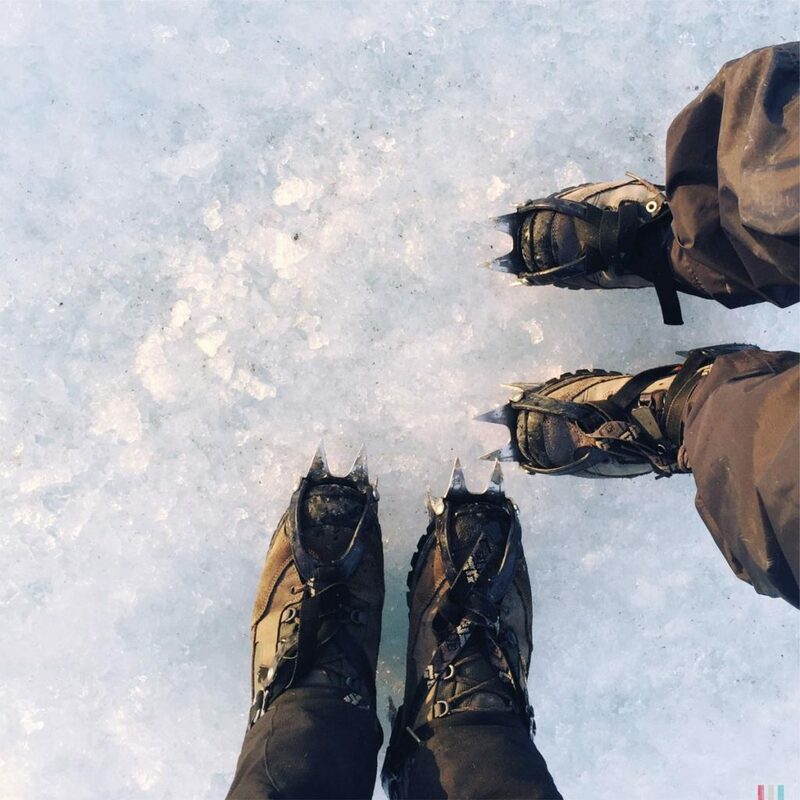 There’s a lot to learn on the ice. For example, how to hike with crampons. Without crampons you won’t get far here. Also important: how to identify snow bridges, crevasses and moulins and why you really should not fall into these things. In the evening we’ve learned how the stay warm and cozy in our tent while it’s -15 degrees outside. Maybe this had been the most important lesson. Everything jagged and white and endless. We had no idea how to stay oriented. Luckily, our guide had. 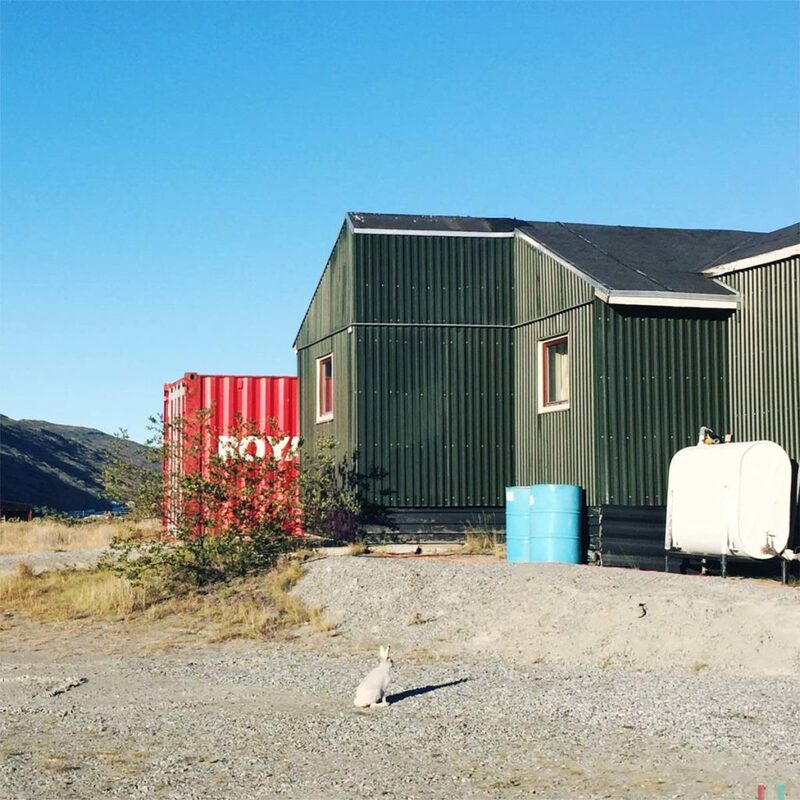 If you’re lucky, you’ll meet some musk oxen around Kangerlussuaq and the ice sheet. 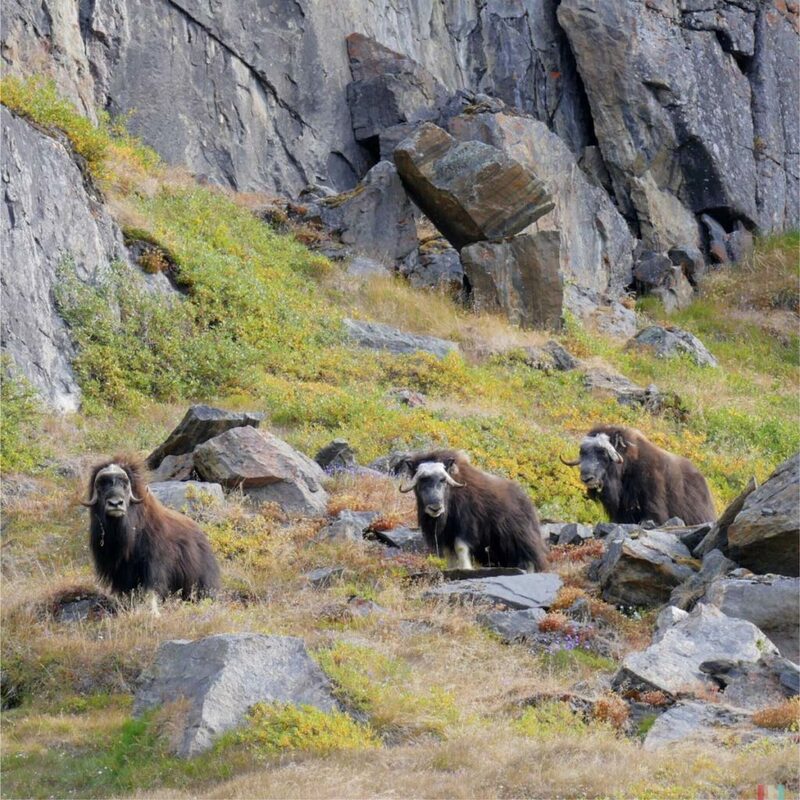 Musk oxen are ancient, prehistoric animals that can only be found in the Arctic regions of Alaska, Greenland and Russia (a smaller group also lives in the Norwegian Dovrefjell National Park). We met some on our way to the ice sheet. Totally surreal. I admit I was looking around immediately, checking if there were some mammoths or sabre-toothed tigers, too. Unreal animals. 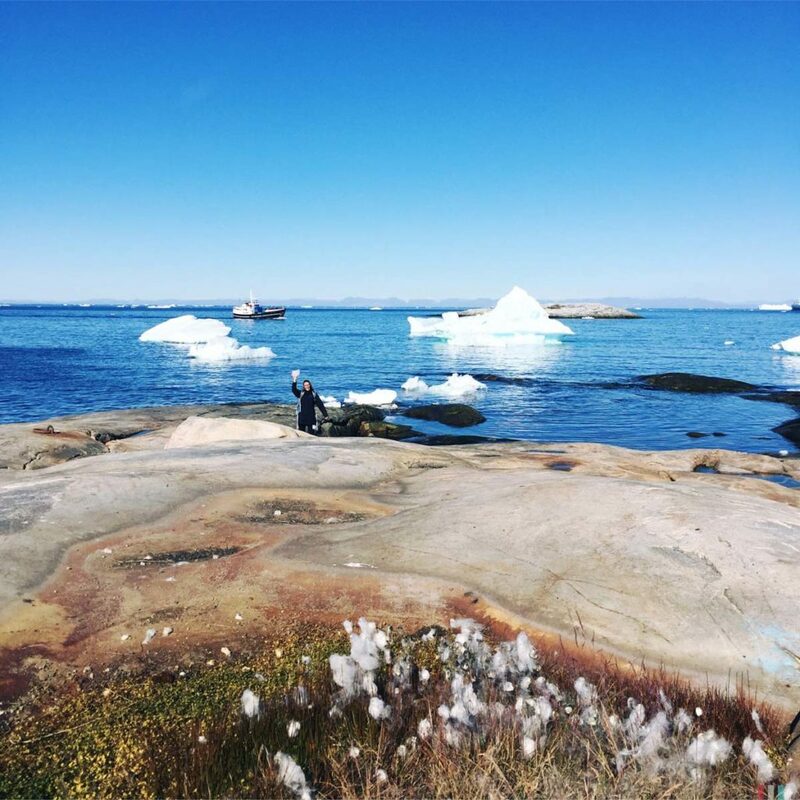 The icebergs of Ilulissat are so huge, they can even make it to Newfoundland, 2.500 kilometers in the south. Icebergs! Icebergs everywhere! Larger than a football stadium! 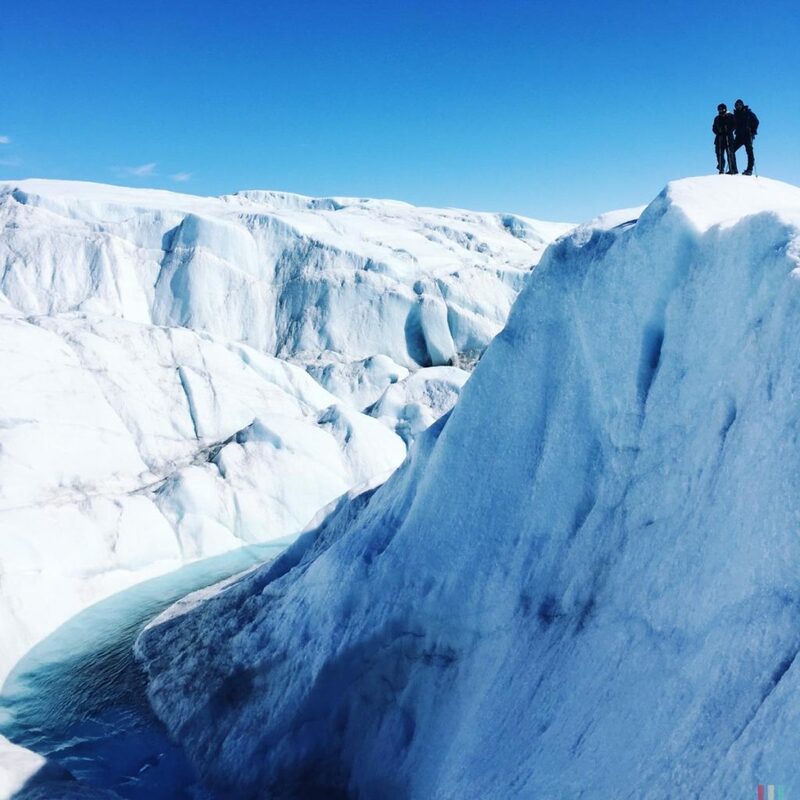 Thanks to the Sermeq Kujalleq, the most active glacier of the northern hemisphere. 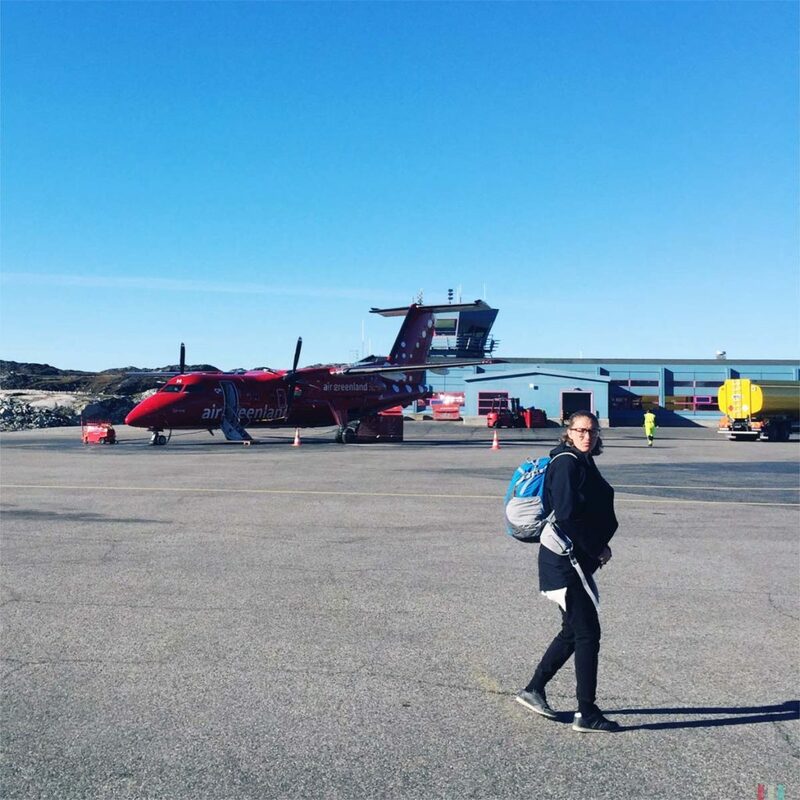 From Kangerlussuaq it takes two hours by plane to get to Ilulissat. 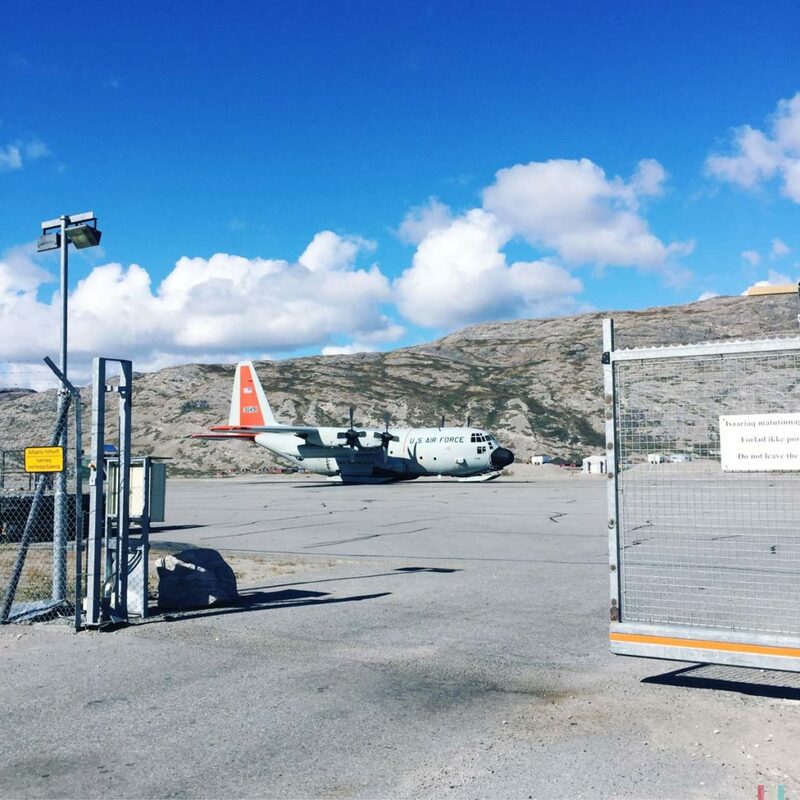 And seeing the landing strip in Ilulissat you immediately understand why you had to hop into such a small plane. An airport like a flattop! 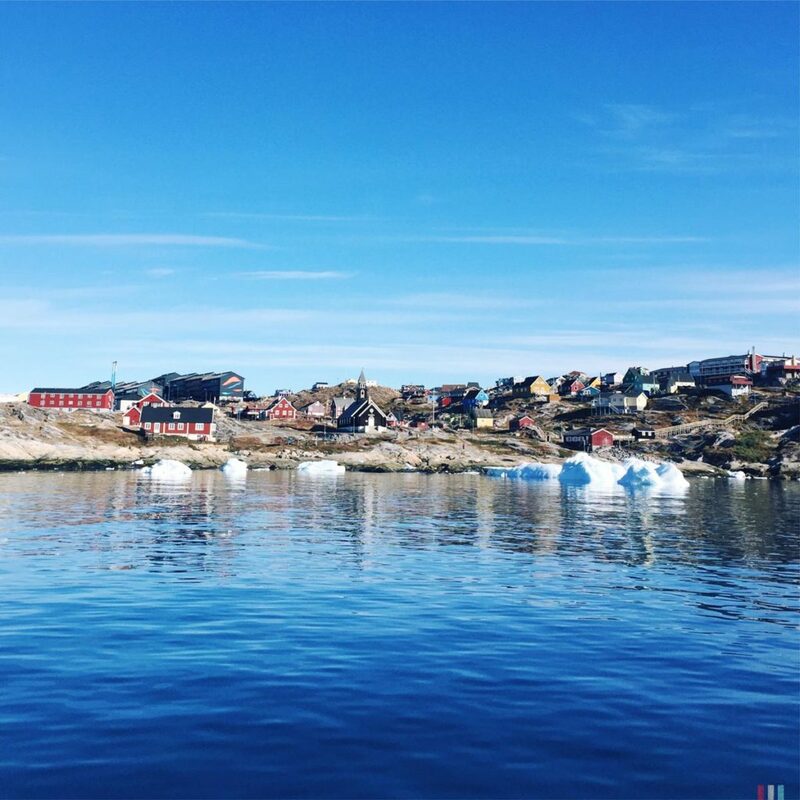 If you ever wondered how it feels like to sit in a plane kickstarting so powerfully that you’re up in the air within five seconds: go to Ilulissat! 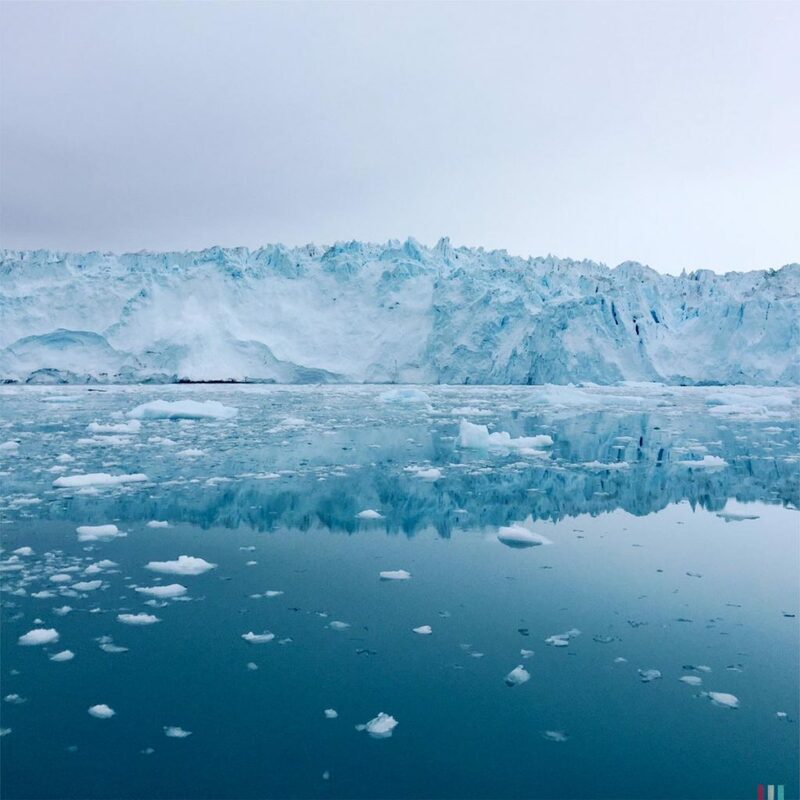 Greenland provides two kinds of ice: the endless ice sheet and giant icebergs. 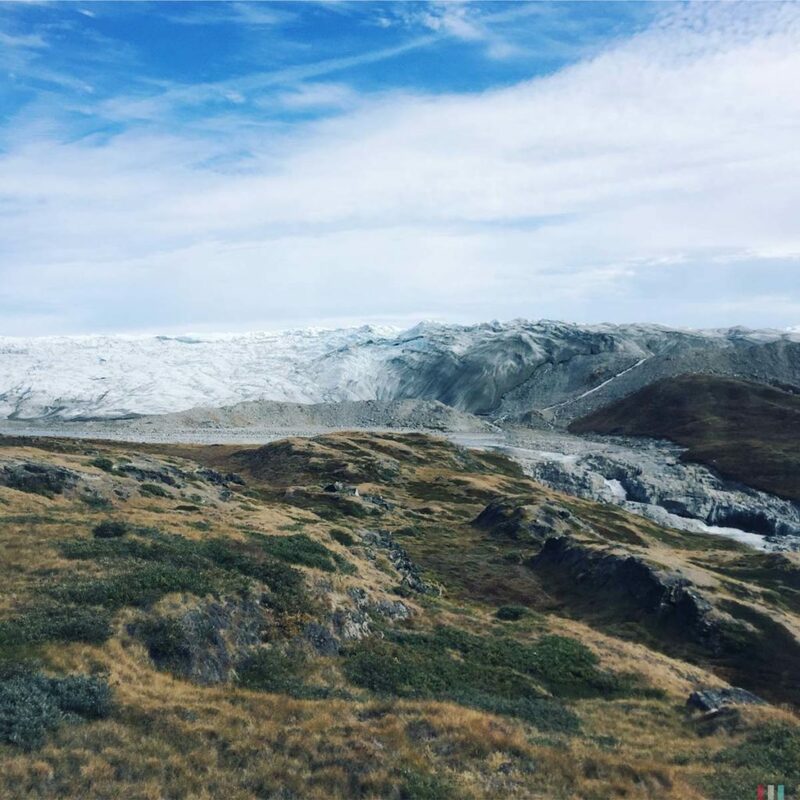 To hike the ice sheet, Kangerlussuaq certainly is the best place. 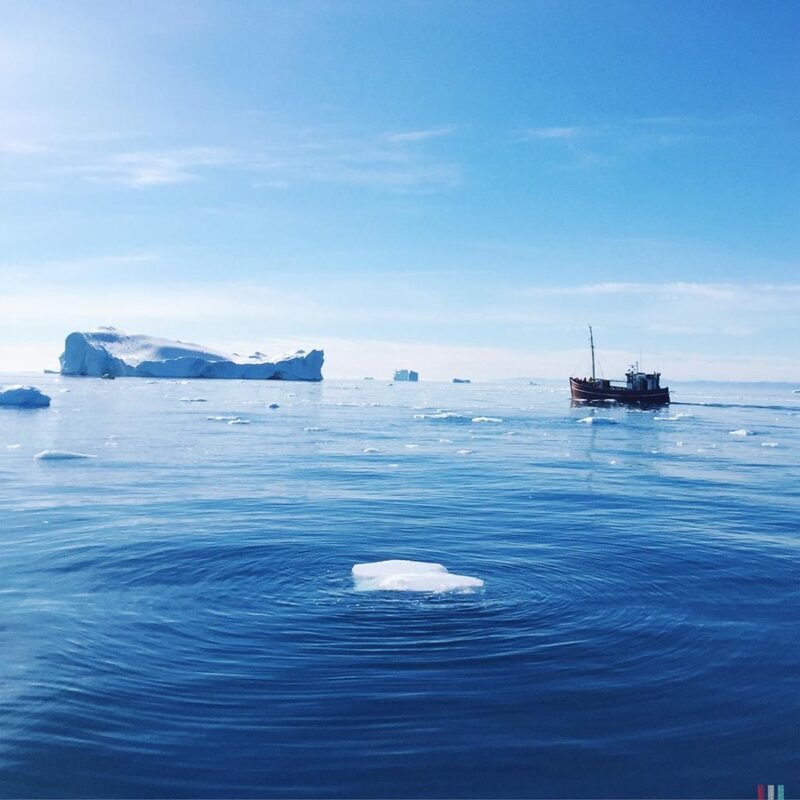 And to witness the enormous icebergs, Disko Bay really is the place to be: In Ilulissat you’ll see hundreds and thousands of giant icebergs. 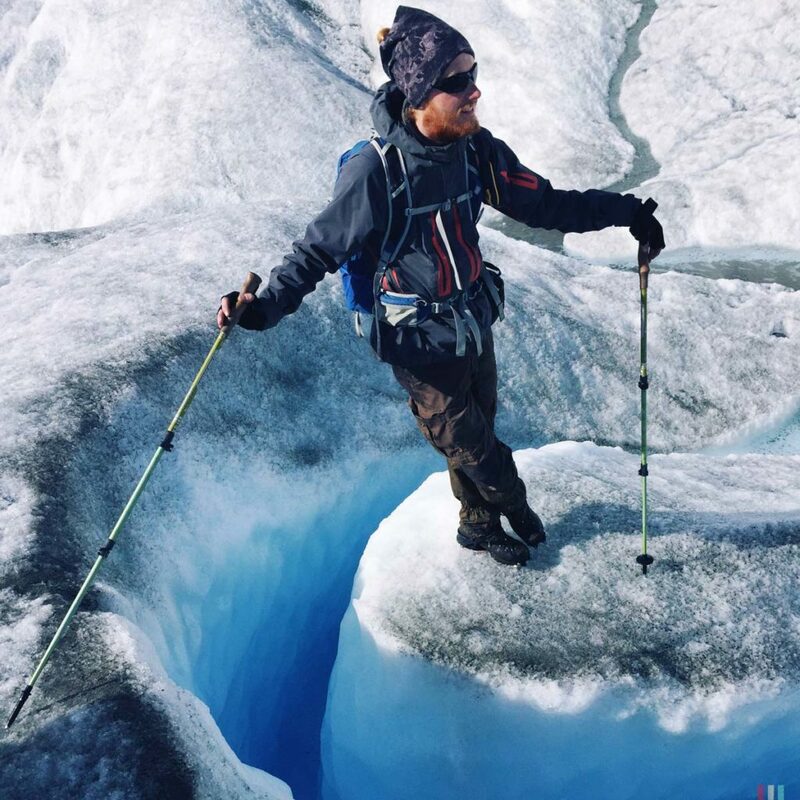 Their source is the Sermeq Kujalleq glacier – the fastest moving and most active glacier of the northern hemisphere. 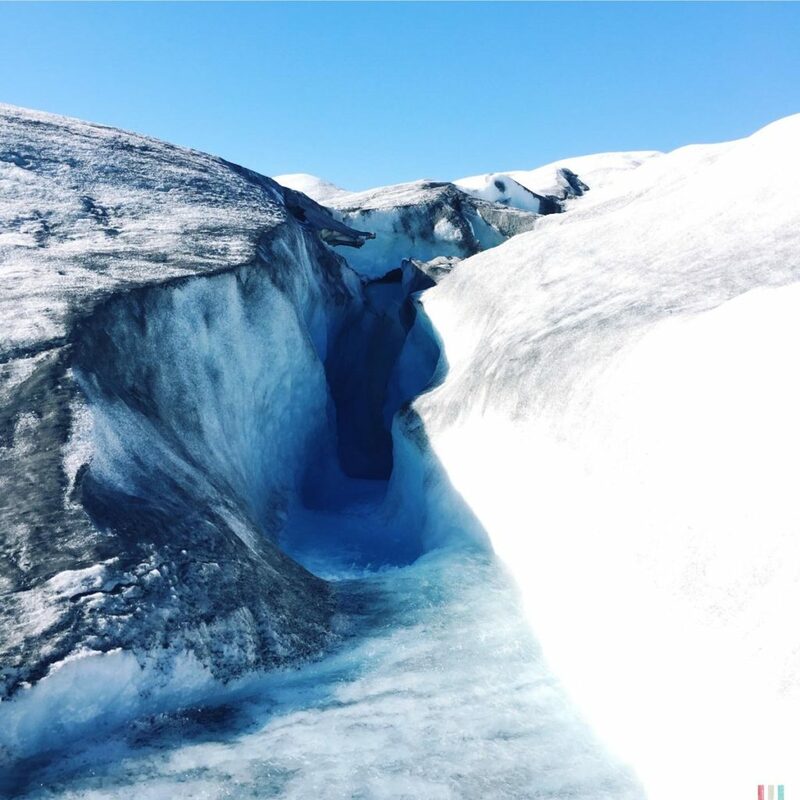 This glacier produces icebergs by piecework. 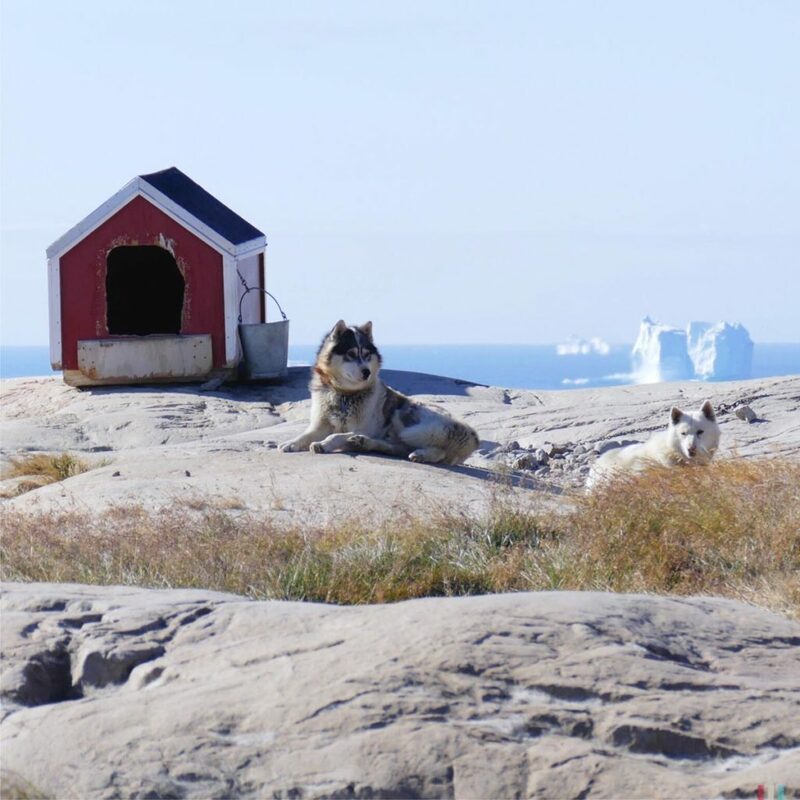 They are big enough to even reach Newfoundland, 2.500 kilometers in the south. 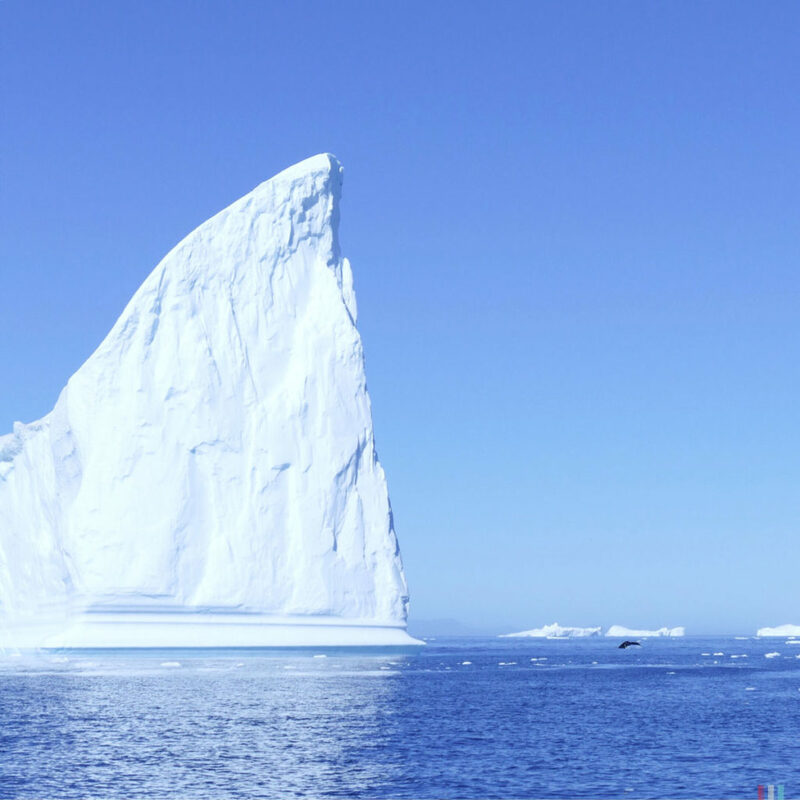 Some icebergs reach sizes of several kilometers (!) in length and several hundreds (!) of meters in height. Very likely, the iceberg that crashed the Titanic back in 1912 came from Ilulissat, too. 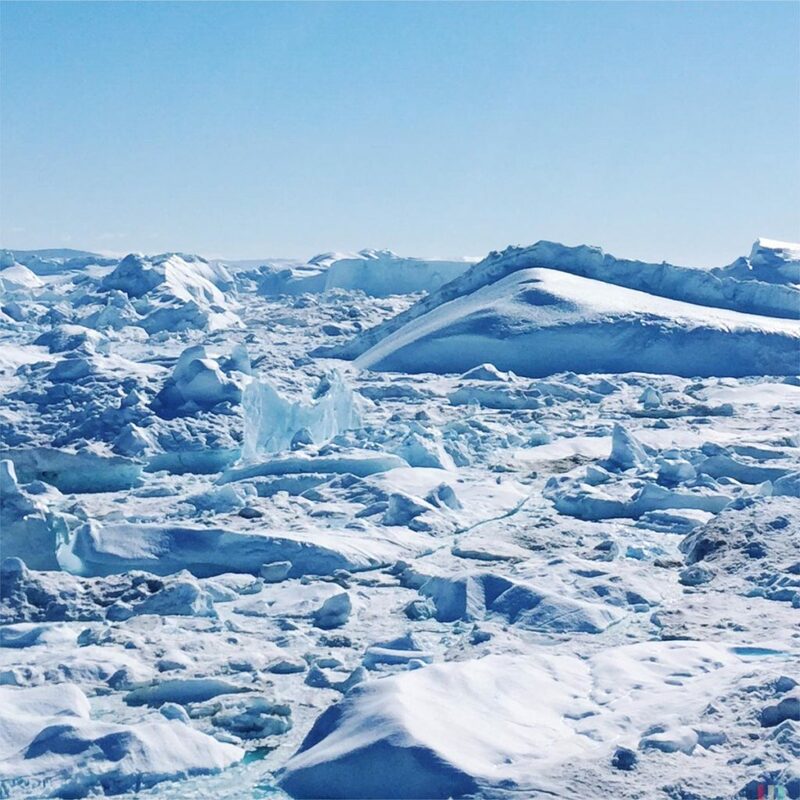 Every year, the Sermeq Kujalleq releases about 35 billion tons of ice, with a straight upward trend. 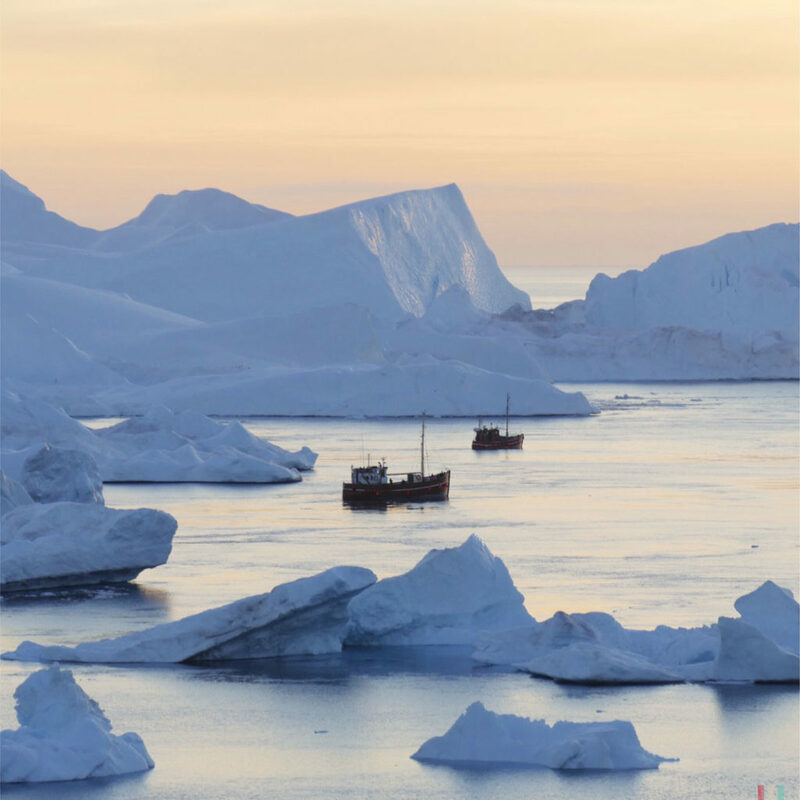 The consequences of climate change are hard to ignore, especially here in Ilulissat. 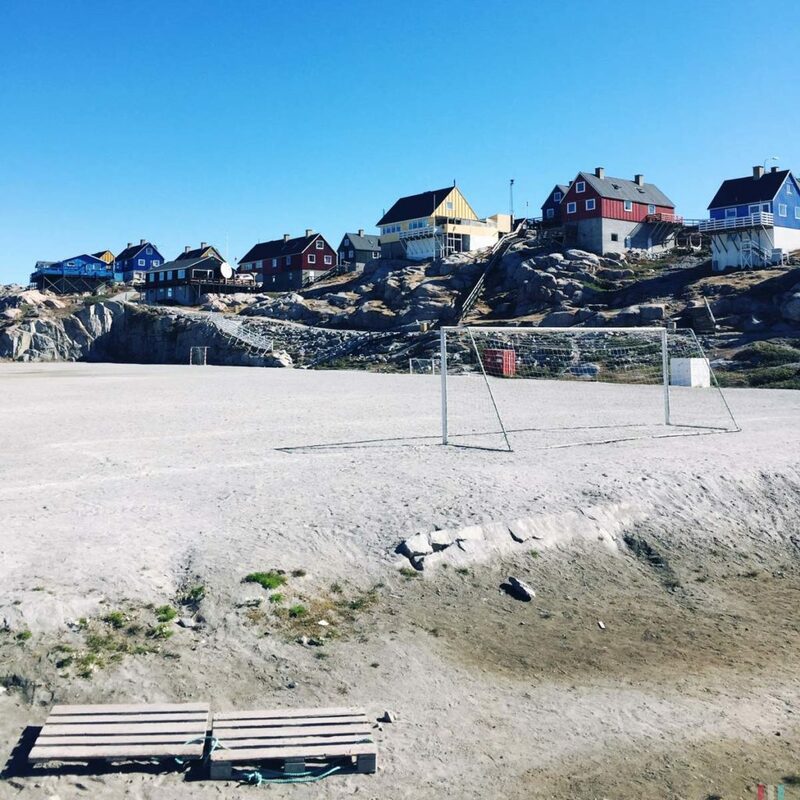 Which is surely not without problems: On the one hand, people come to Ilulissat to witness and understand climate change. On the other hand, long travels like this are heating up the climate even more. Difficult. Evening at the icefjord. Freezingly cold. 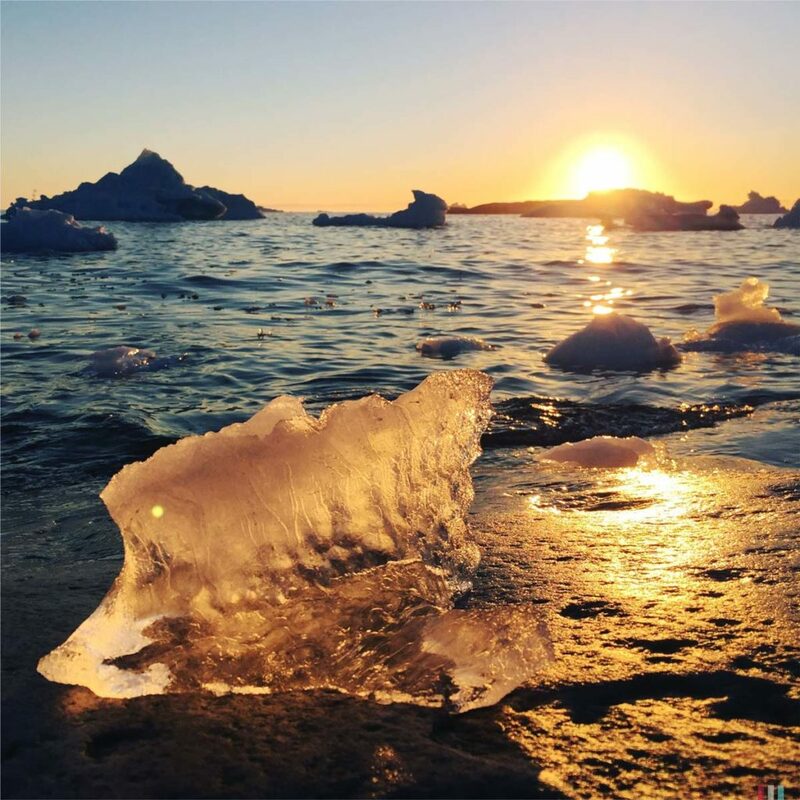 Ice in the midnight sun. Billions of tons of ice. 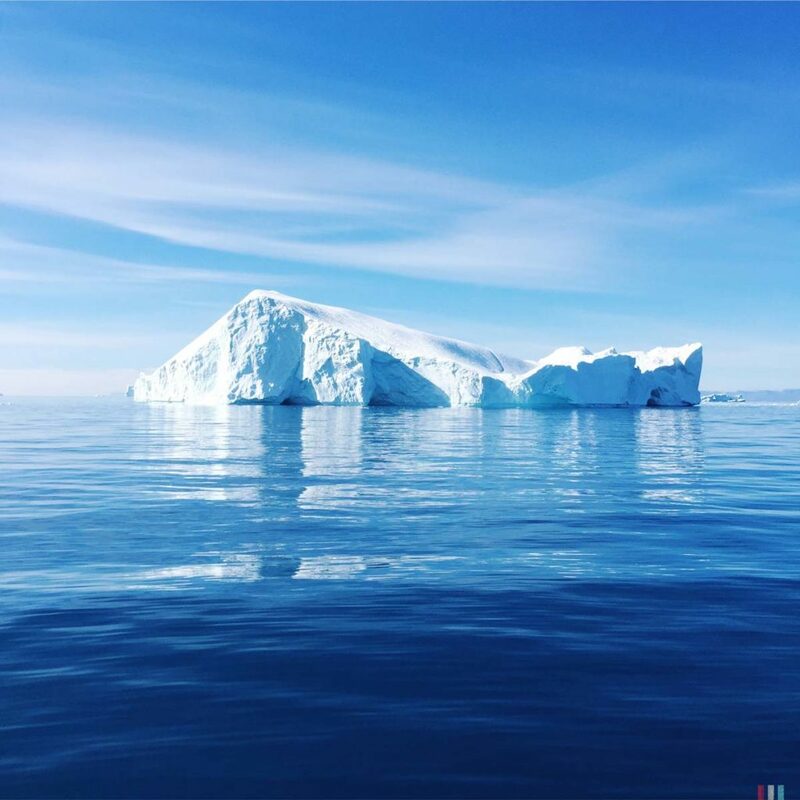 From the edge of the glacier 40 kilometers upcountry the icebergs float almost one year through the Ilulissat icefjord until they reach the open ocean. 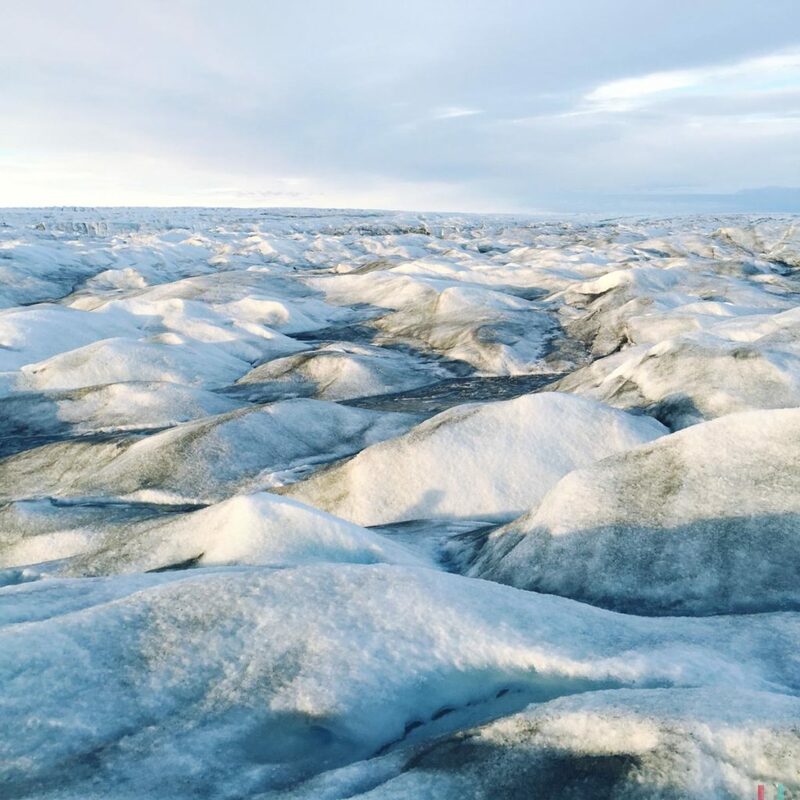 The icefjord is mostly 1.5 kilometers deep, but right before meeting the ocean it’s only a few hundred meters, a natural threshold, stacking and piling up all the ice until the pressure is too strong. A giant icy traffic jam, all crackling and rumbling. 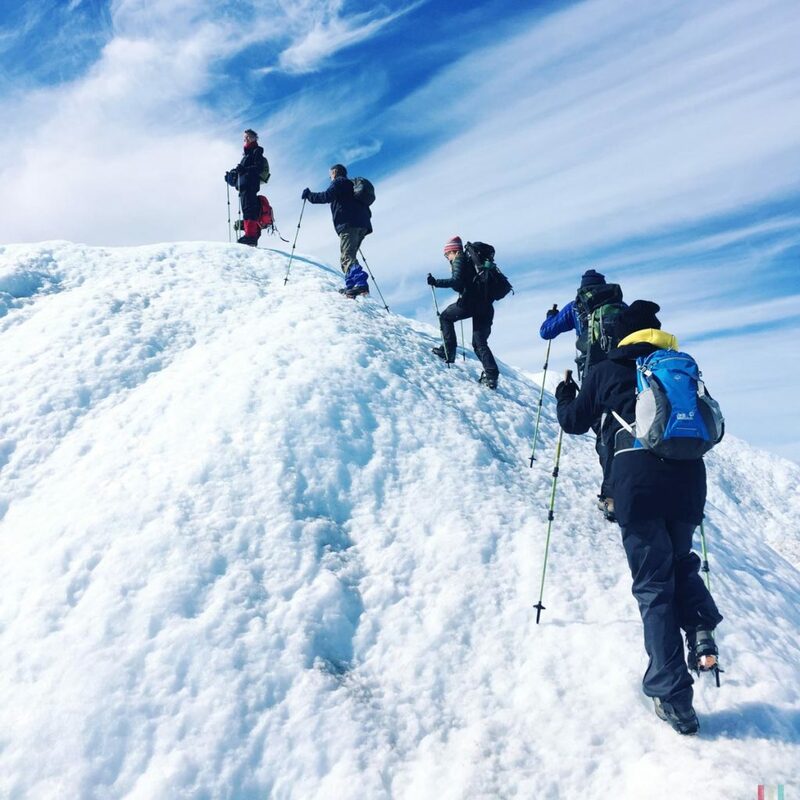 Several trails lead alongside the icefjord, you can hike there for hours, with perfect view on thousands of floating and stacking icebergs. Bizarre colors, grotesque shapes; massive, impressive and totally different every day. 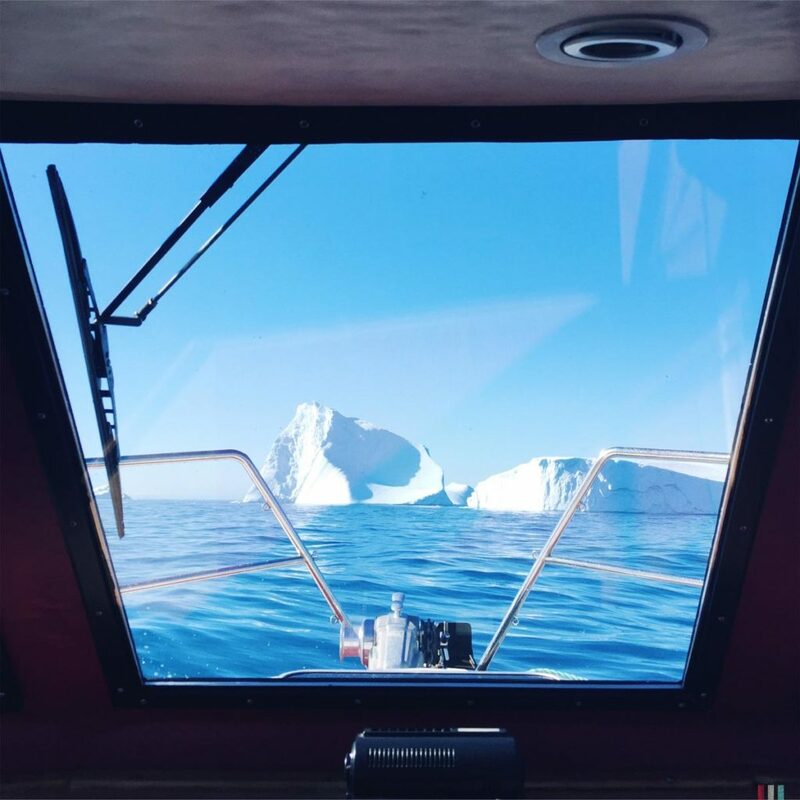 We spent one week looking at icebergs. Per boat, per foot, in the morning, during the day, in the evening, at night. It didn’t get boring for a second, not even on the seventh day. 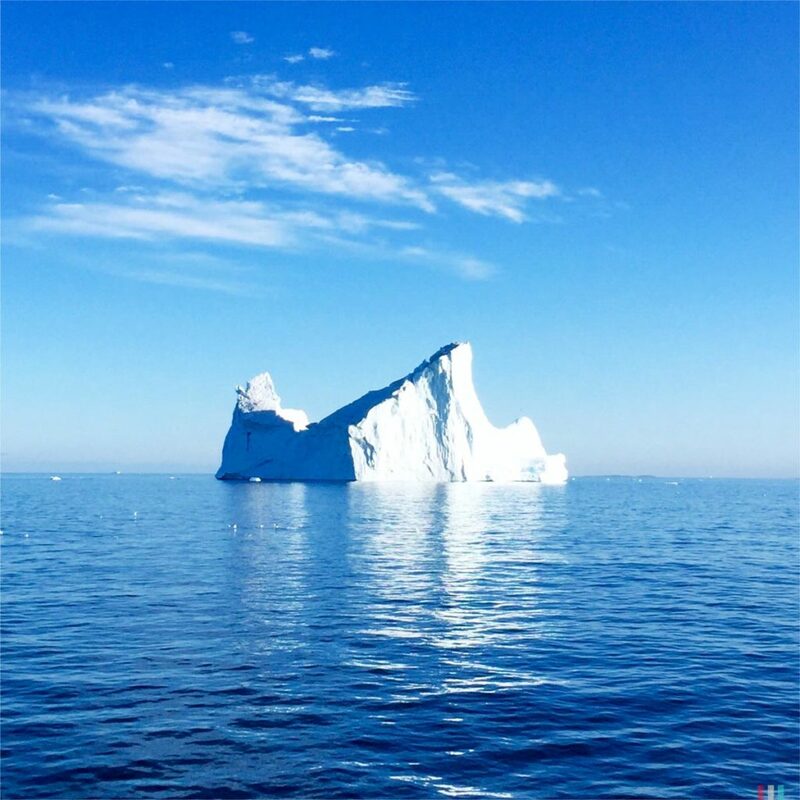 For most of the icebergs you have to imagine nine times the weight beneath the surface. Challenging. 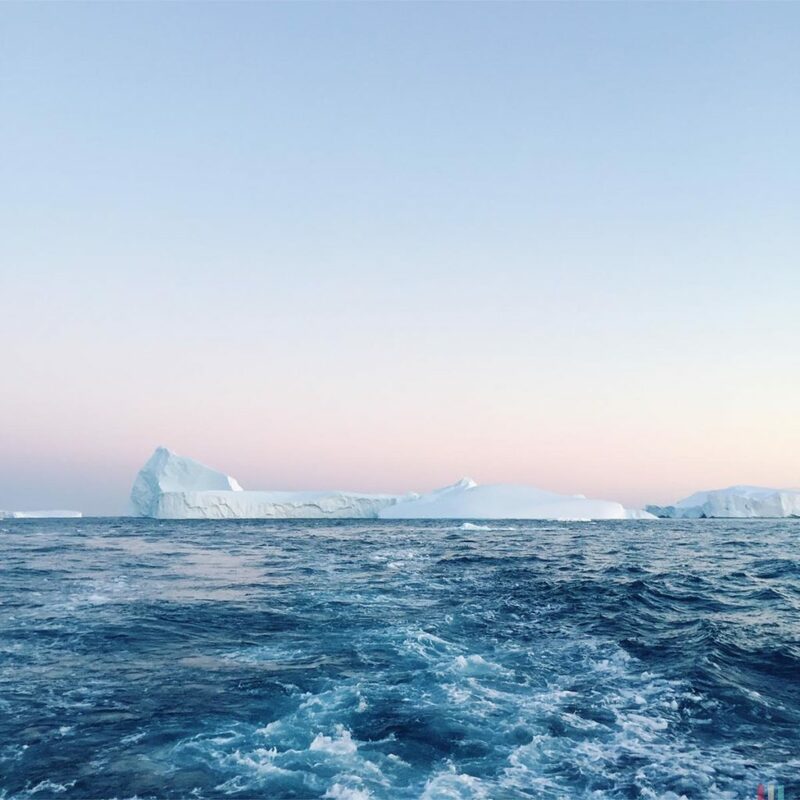 What you’ll learn during those iceberg safaris: the ice ratio above and underneath the surface varies depending on the tiny little air bubbles trapped in the ice. 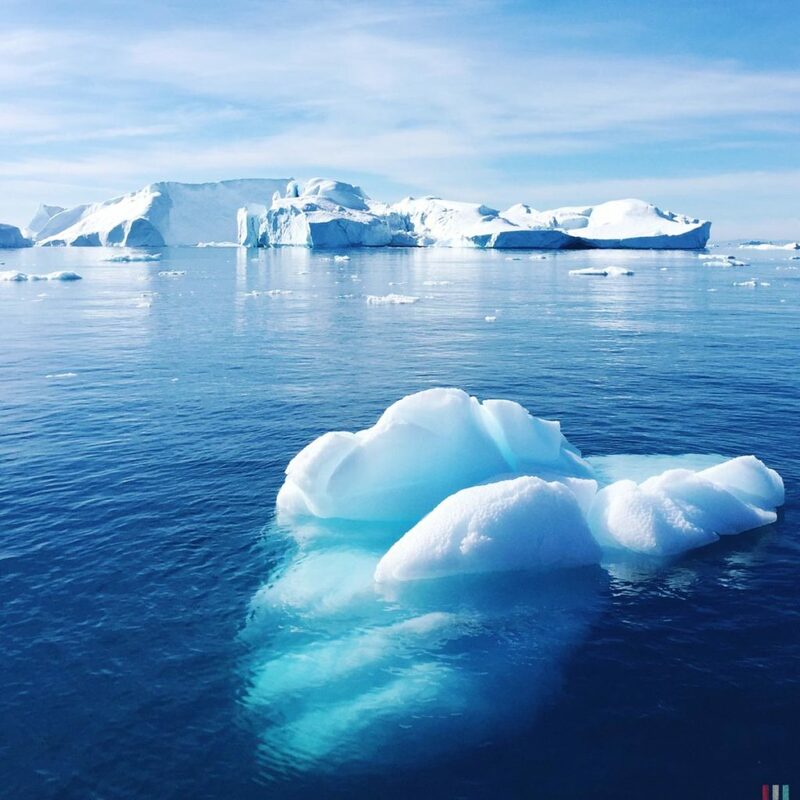 If there’s a lot of bubbles in the ice, it’s relatively light – and you’ll have 1/7 of the iceberg above and 6/7 below the surface. 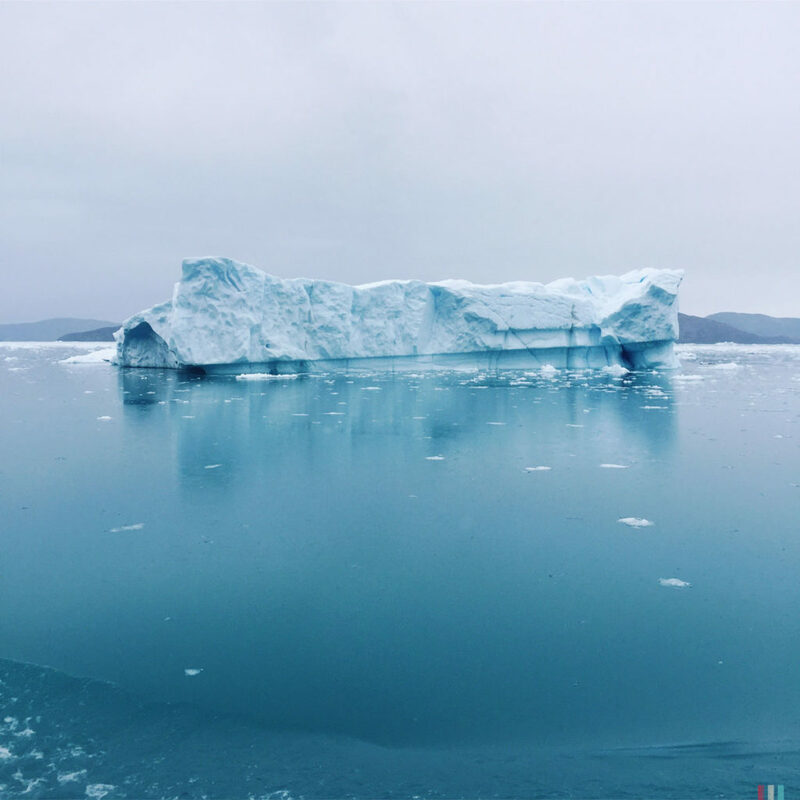 If there’s less air in the ice, it’s heavier – which leads to 1/10 above and 9/10 below the surface. Also, those ancient air bubbles are the reason the ice makes these everlasting crackling sounds while floating. When it’s windless you’ll hear it everywhere. 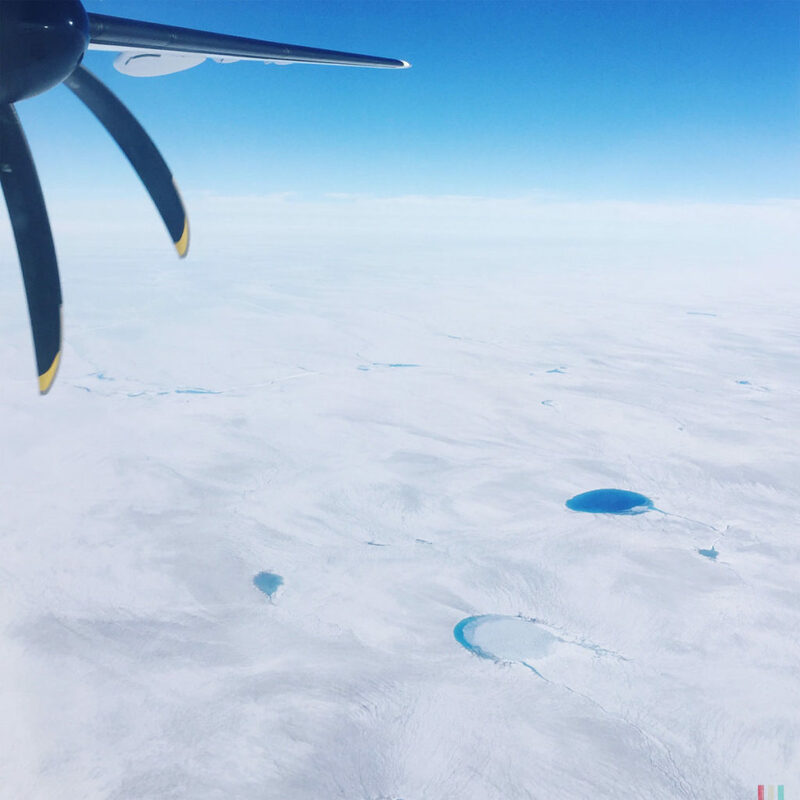 The Sermeq Kujalleq glacier produces mostly very firm and solid ice, with only few bubbles. Heavy ice. 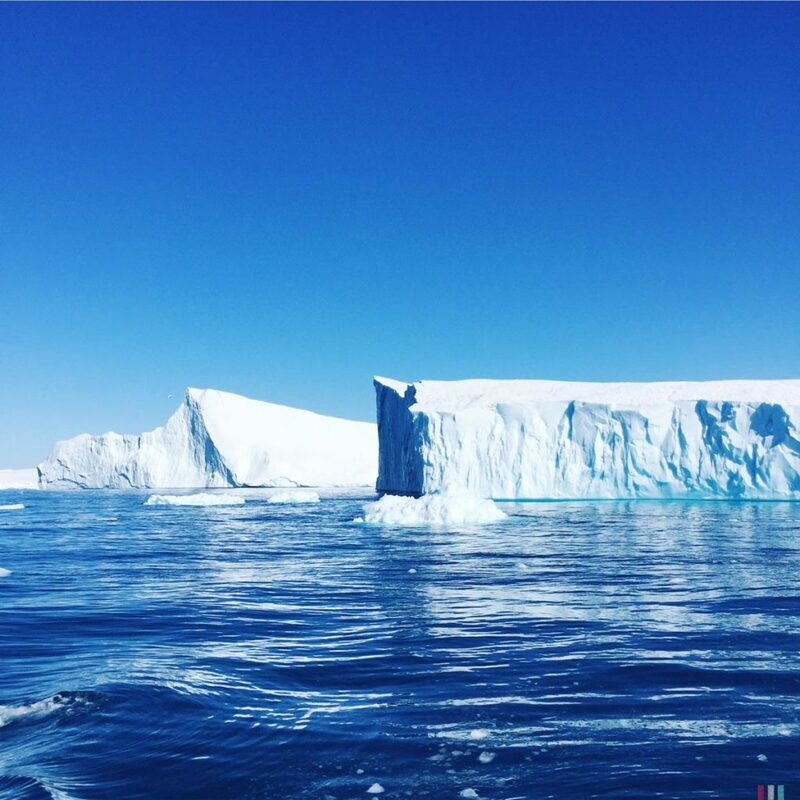 So, for most of the icebergs shown here you have to imagine nine times the weight beneath the surface. 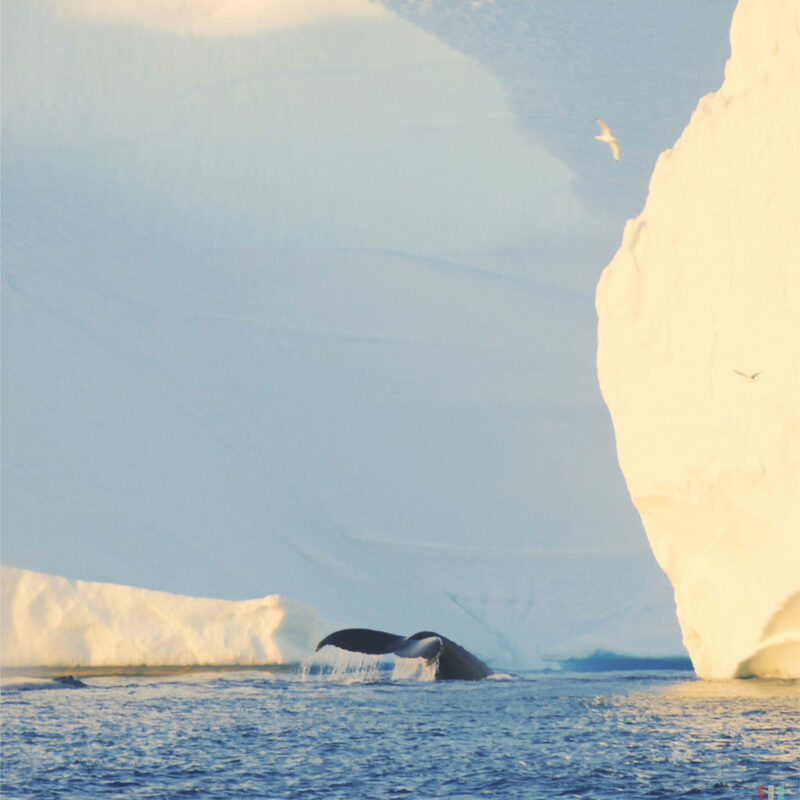 A humpback whale surfacing close to an iceberg. The icy water is extremely rich in food. 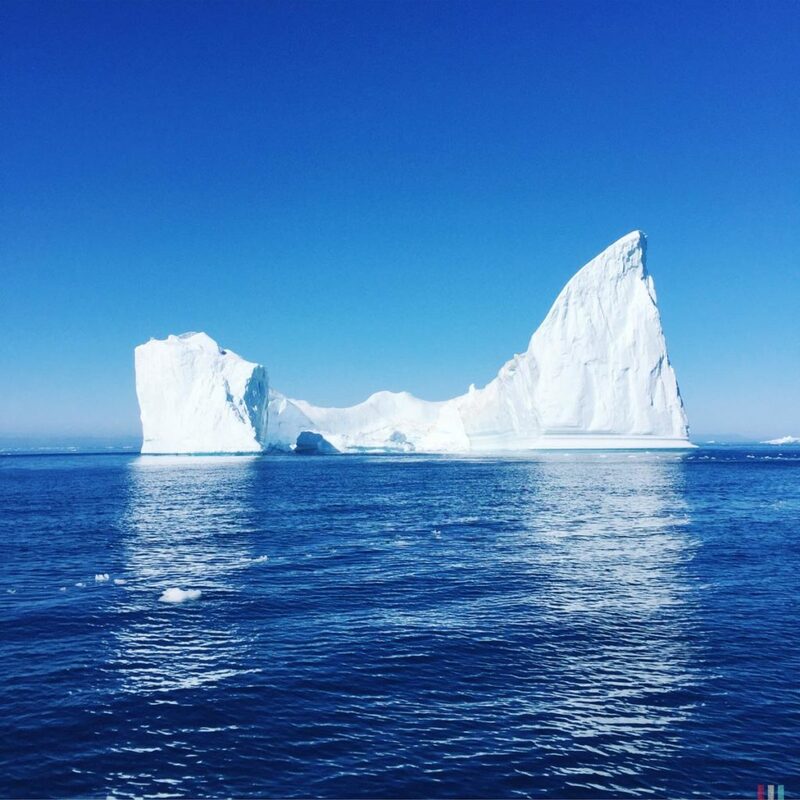 Humpbacks, minkes, fin whales: there's a lot of action going on around those icebergs. Also at night, thanks to the midnight sun. 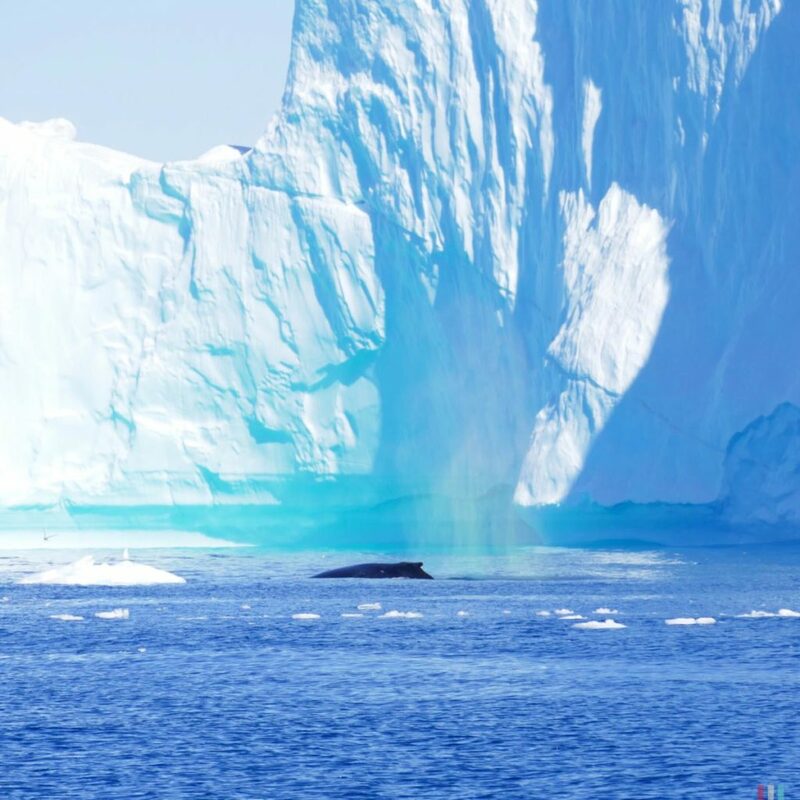 Greenland is a fantastic place for whale watching. In theory you can even meet narwals, belugas and bowheads here, but you need some luck and have to travel far north. The arctic whales prefer to stay close to the ice edge, they travel north as soon the sea ice breaks in spring. 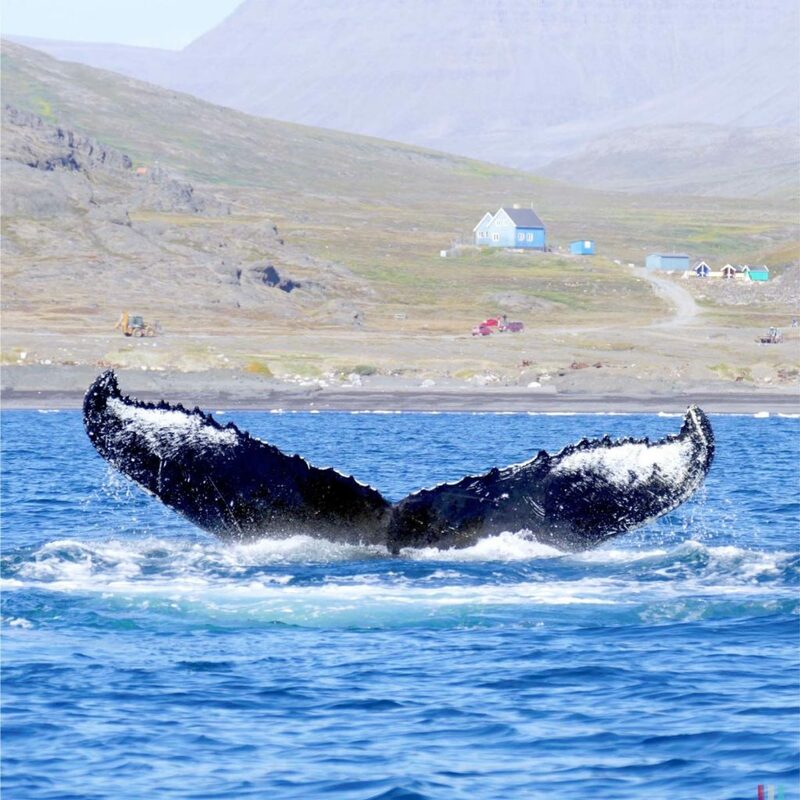 But you’ll meet a lot of other whales around Greenland, too. 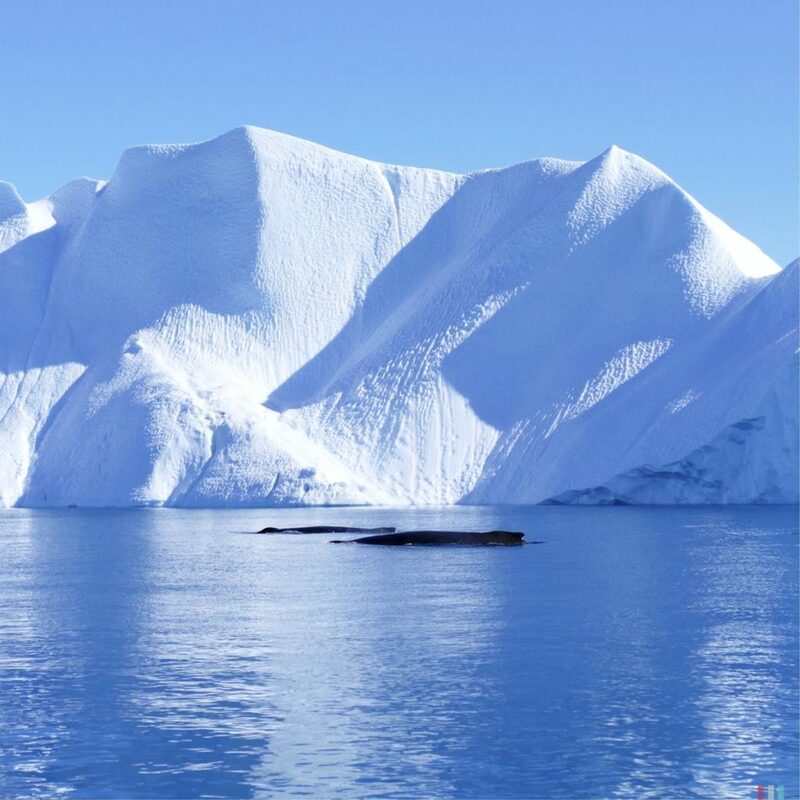 The ice cold waters are rich in food and therefore rich in whales.  You can see humpbacks, minke whales and fin whales, occasionally also orcas and sperm whales. 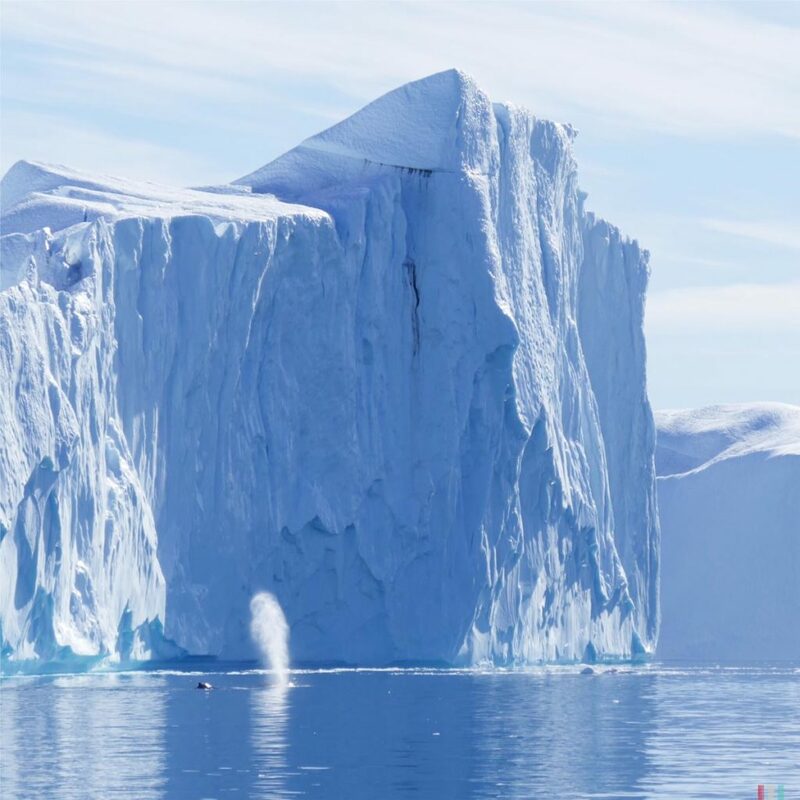 There’s a lot of action going on around these icebergs. 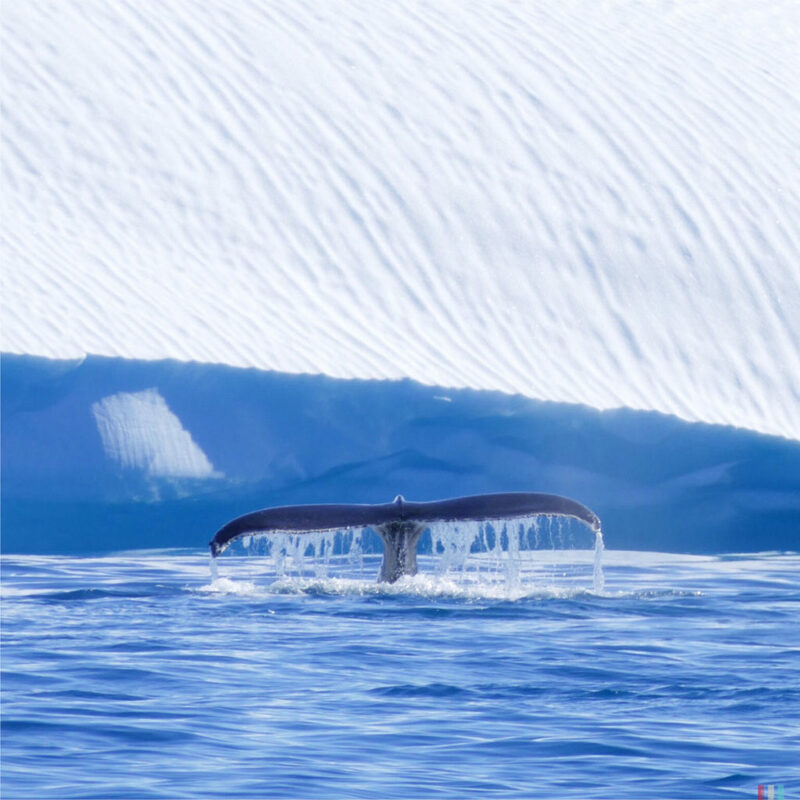 And what’s more beautiful than seeing a giant whale fluke in front of an iceberg? 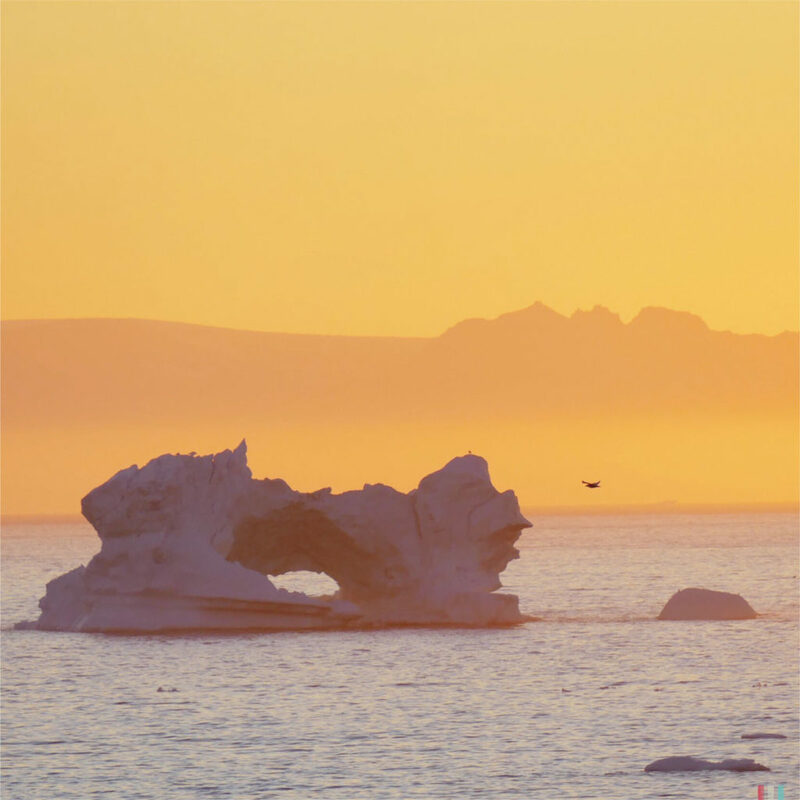 Maybe a giant whale fluke in front of an iceberg during midnight sun. We hopped on a boat every day. 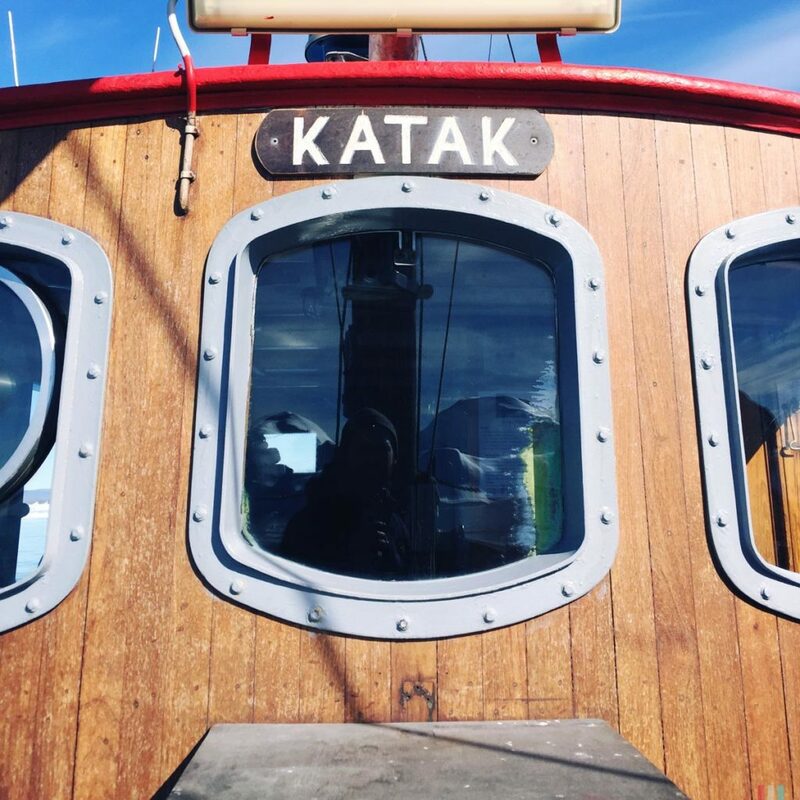 Sometimes with an Inuit captain, sometimes with a former engineer from Heidelberg, Germany, who decades ago fell in love with Greenland so badly that he decided to buy a boat, become a captain and stay there forever. Now he’s doing iceberg and whale safaris every day. There’s definitely worse jobs available. Close to the boat: a humpback. Big: iceberg. Very small: whale fluke. A humpback in the evening sun. A fin whale, seen from the beach. 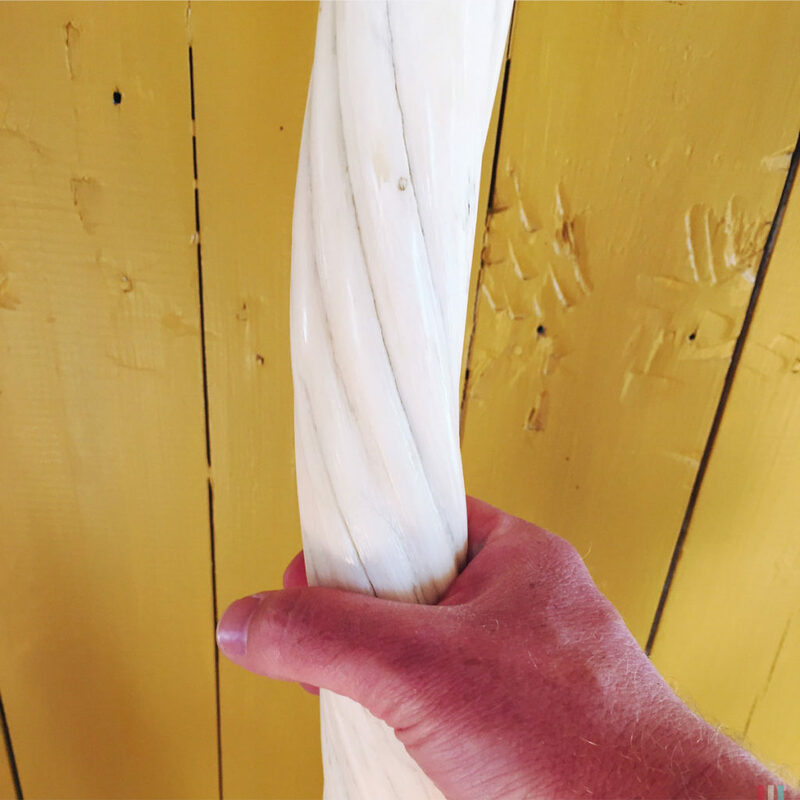 Two meters long: a narwals tusk. I prefer the mid-sized boats. 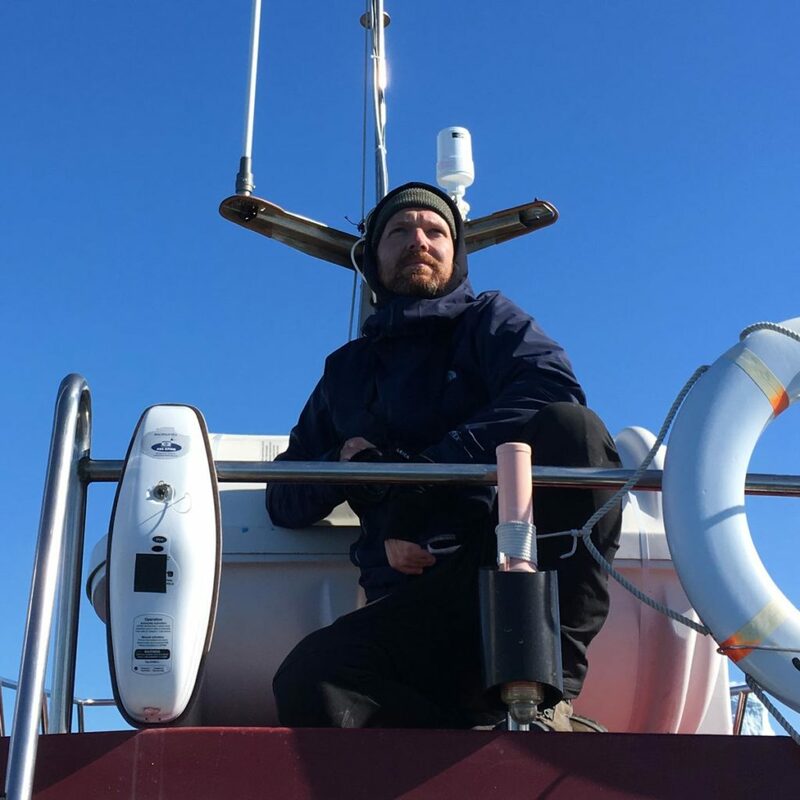 Sometimes we find ourselves sitting in these very small inflatables, 3 meters length, and I’m always a bit scared sitting in such a small boat in the middle of the ocean with large whales coming close. Especially with the humpbacks. Humpbacks can be up to 15 meters and weigh about 30 tons. And they love to breach! That’s when you need to trust them: that they are aware of you; that they don’t feel bothered; that they know what they’re doing. 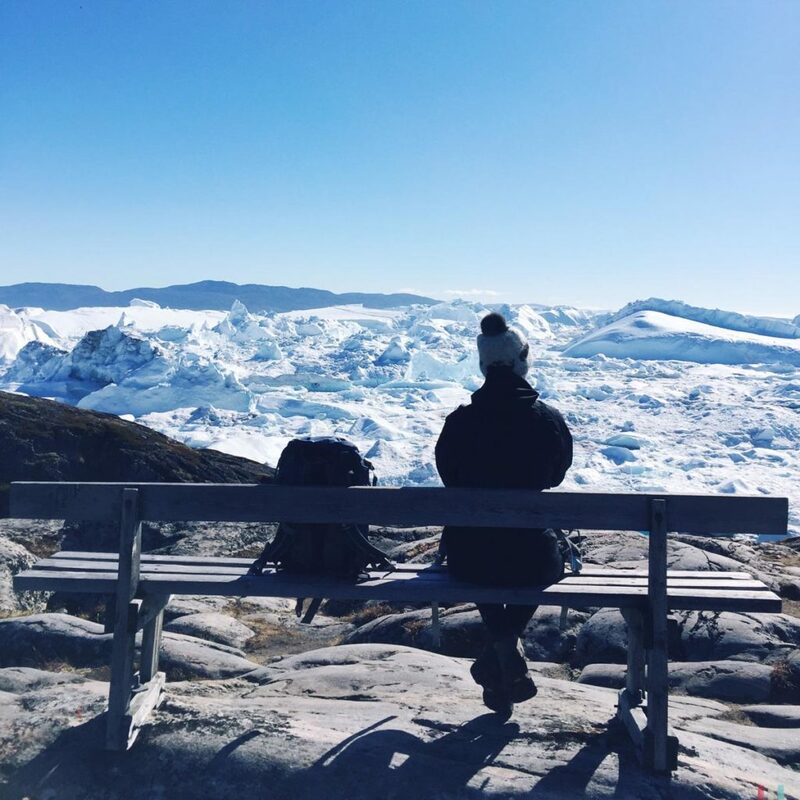 The lesson I learned in Greenland is that I’m not alone with my worries. I told an Inuit about it: that I’m always feeling a bit uncomfortable, sitting in a tiny little zodiac with these giant breaching humpbacks around. And he laughed aloud – and told me that he’s feeling the same. Then he showed me a video on his mobile phone: a humpback, maybe five meters next to his boat, joyfully breaching. »You just have to trust them. They’re always aware of you. And they know what they’re doing.« He’s Inuit. He knows. From now on I’ll be faithful. No more worries. A humpbacks fluke. Every fluke is unique. Like a human fingerprint. 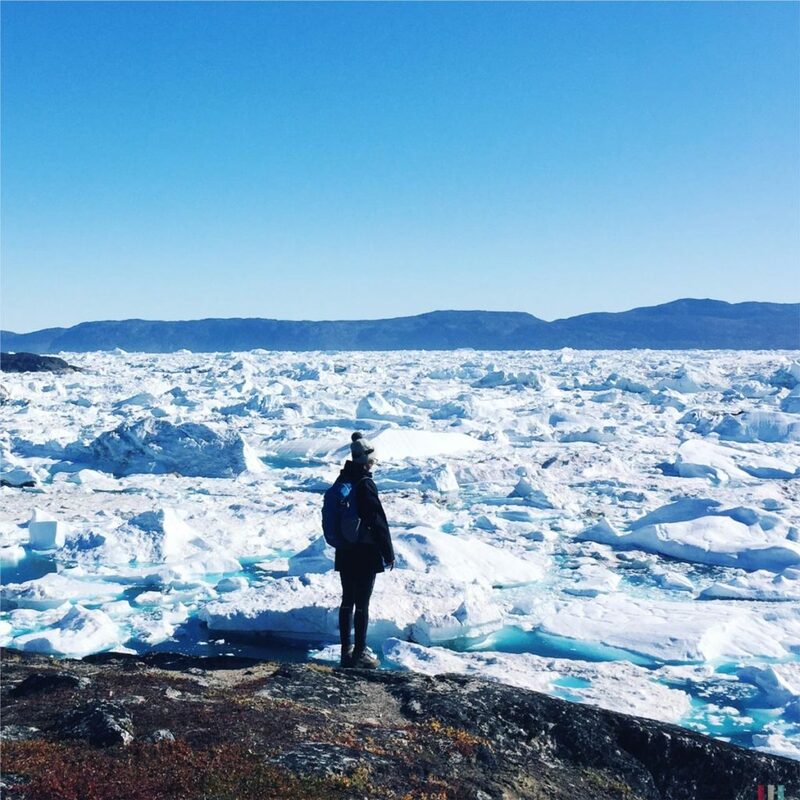 On the other side of Disko Bay is Qeqertarsuaq. 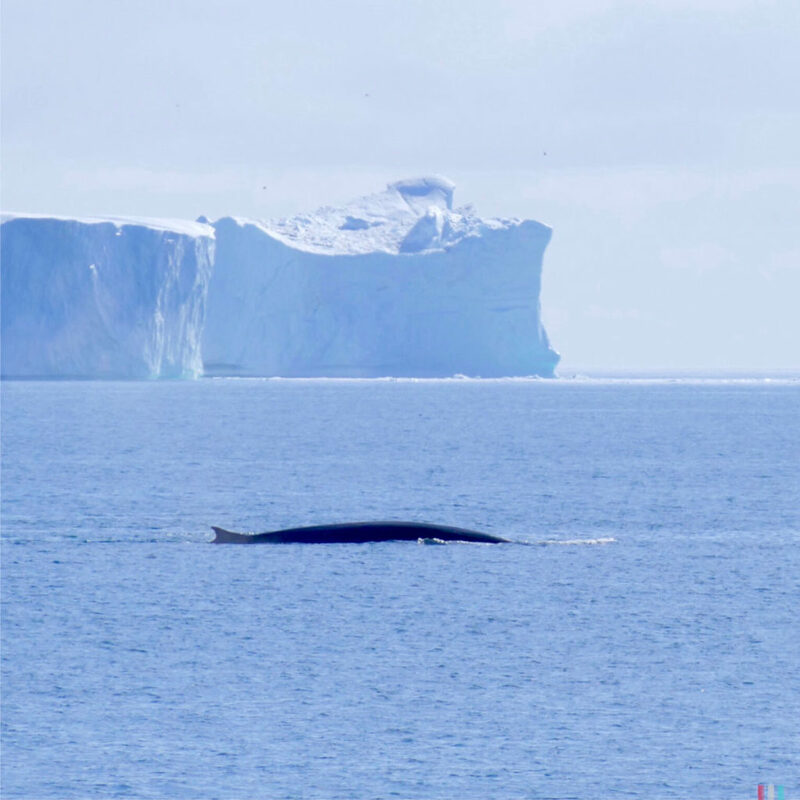 Here you can watch the giant fin whales - even from the beach. 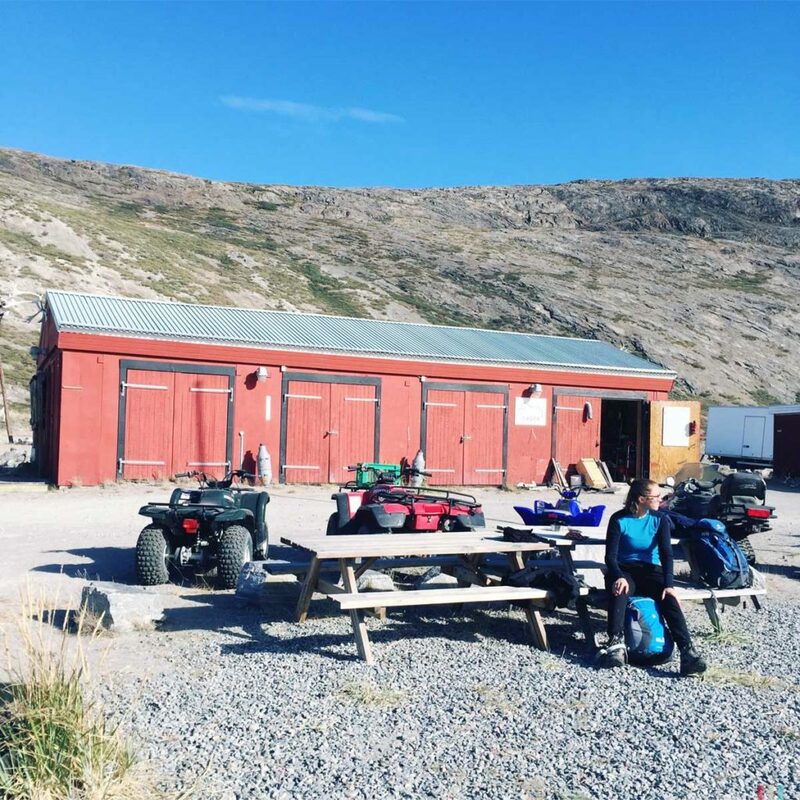 A guide in Ilulissat had told us about some great hiking trails around Qeqertarsuaq. He mentioned the many whales there, including fin whales, after the blue whales the second largest animals on the planet. And he also mentioned that they often travel really close to the beach. 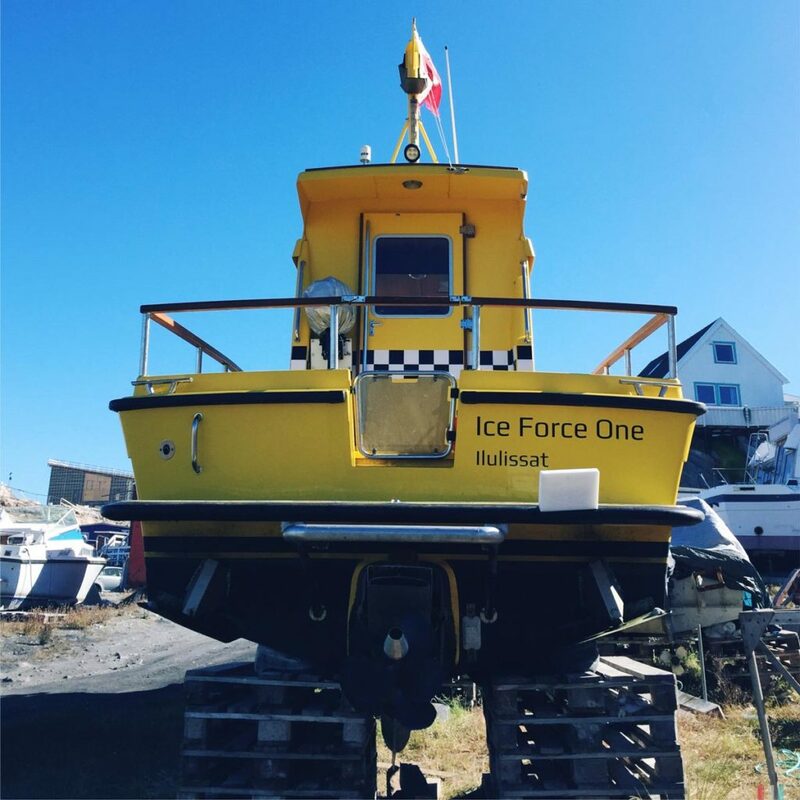 So, the next day, we took a ferry to Qeqertarsuaq. 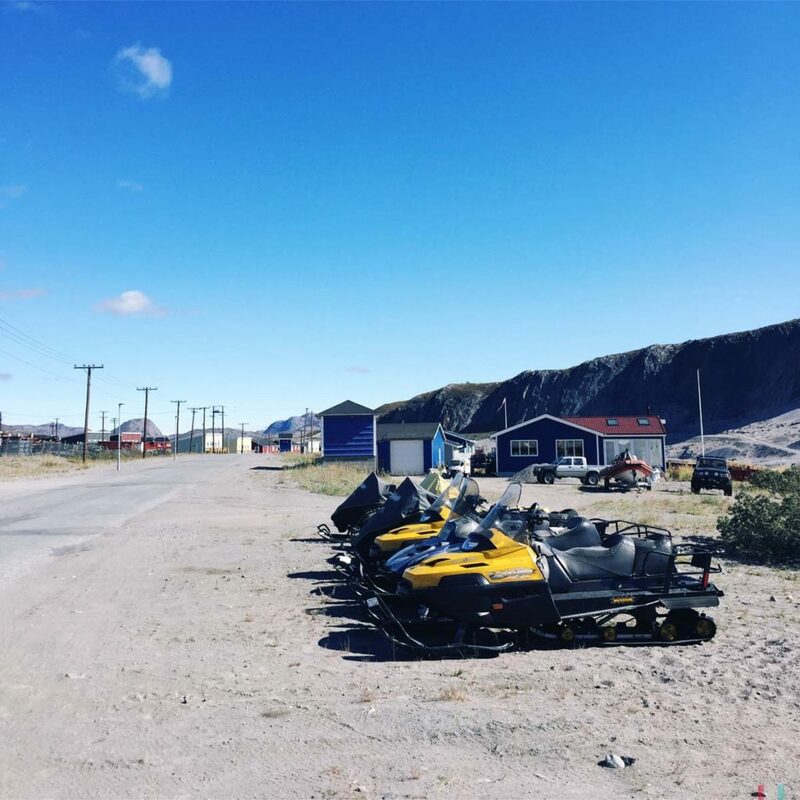 Qeqertarsuaq is as remote as Kangerlussuaq. Minus the airport. 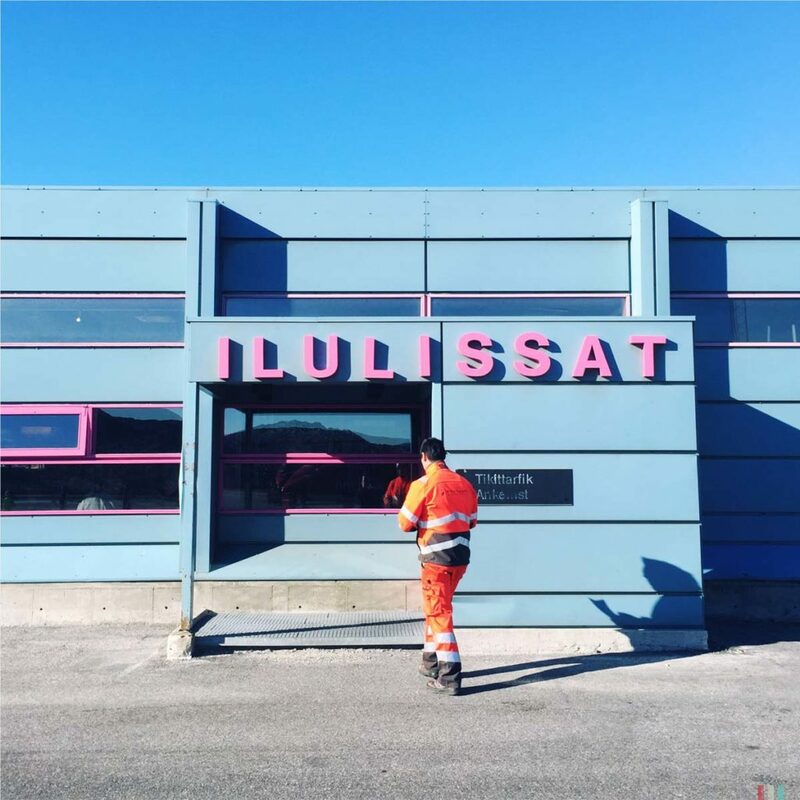 And compared to Ilulissat, Ilulissat is a vivid urban jungle. Colored cabins, the village life centred around the local supermarket, no tourists. Everything quiet and peaceful and simple. I love those places. In a small shop we asked an Inuit if he knew someboday who would get us on a boat. 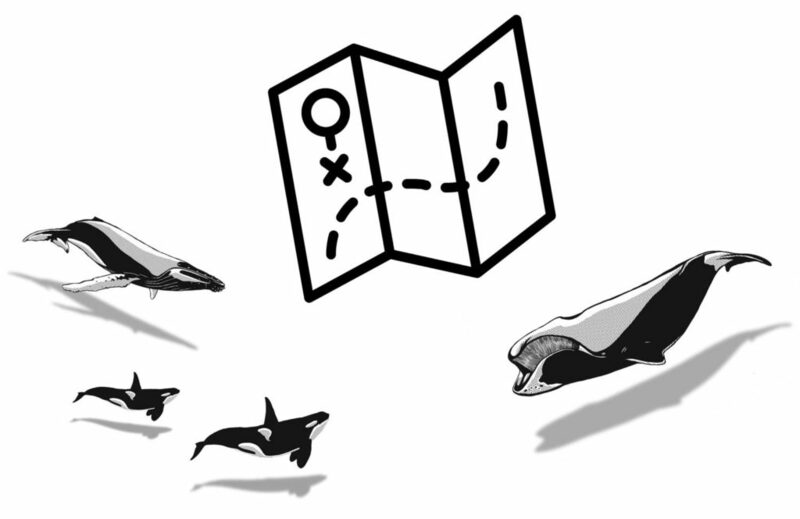 To meet the whales. »My father will do that, I’ll call him«, he said, »just be at the harbor in about one hour, he’ll pick you up.« Time for a short walk at the beach. In the distance three or four whales surfacing, maybe 200 meters away. 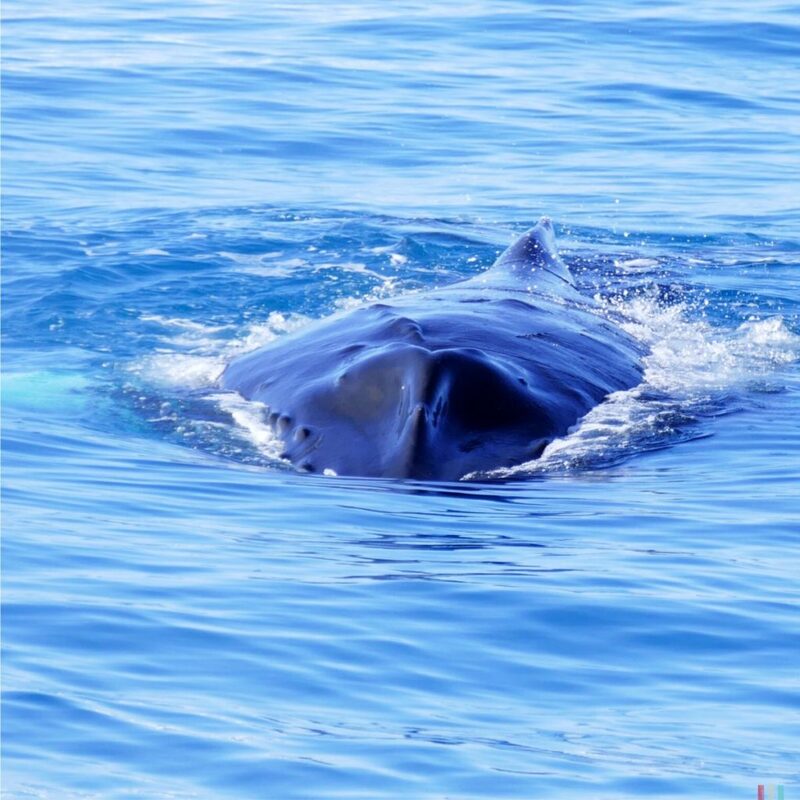 High blow, endless back, edgy fin – no doubt: fin whales! 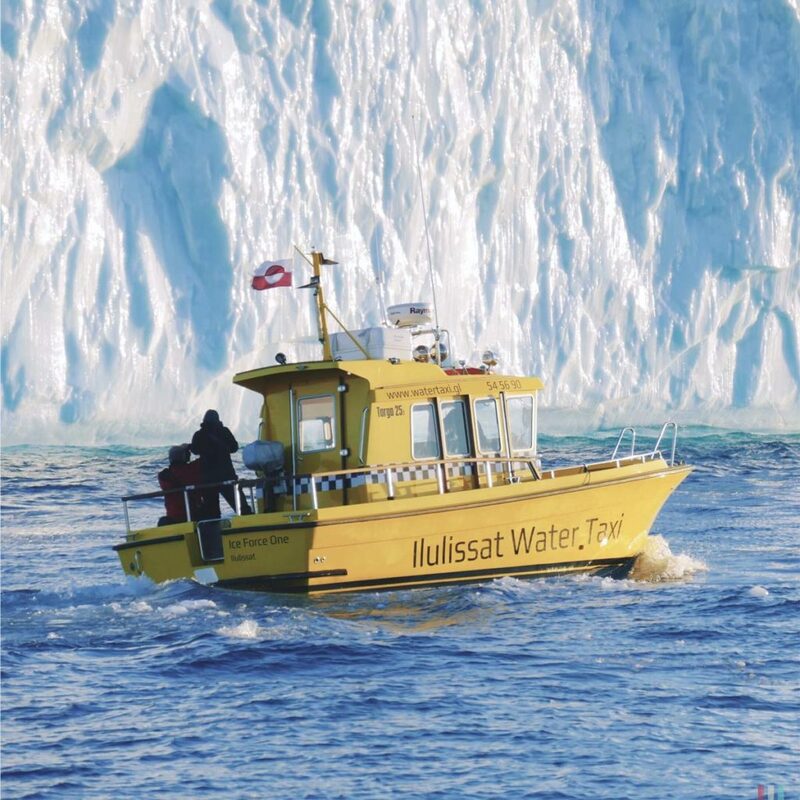 The guide in Ilulissat knows his business. One hour later, meeting the old Inuit at the harbor. A small but robust guy, maybe fifty, maybe ninety, impossible to tell. He gives us a warm welcome on board. A small and solid boat with room for four people. 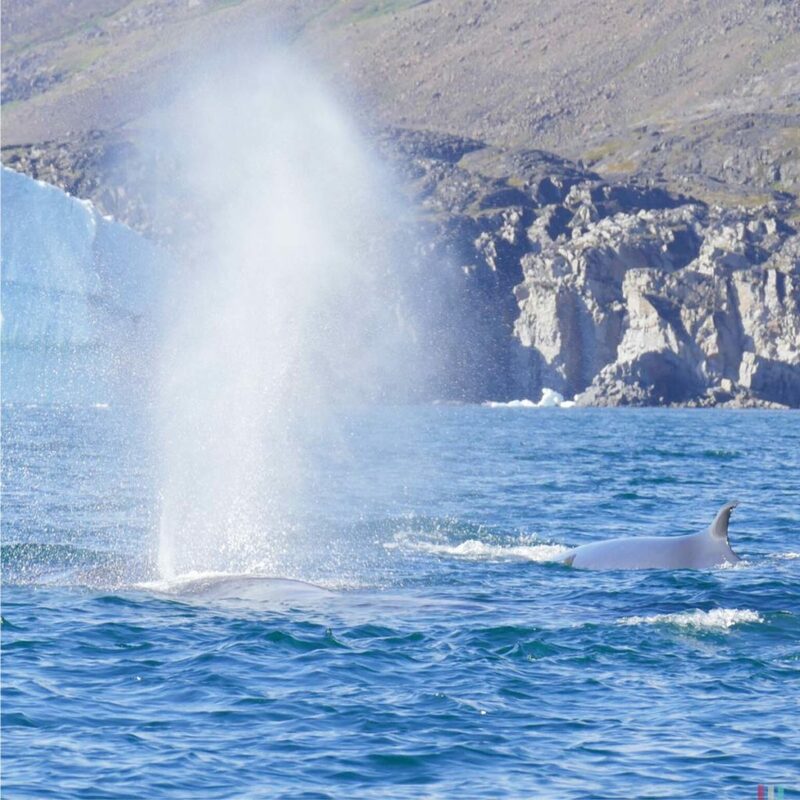 Four fin whales, traveling in the Disko Bay around Qeqertarsuaq. Fin whales are the second largest animals of all time. It took us a while to meet the fin whales again. Although they’re extremely huge they’e not easy to find. 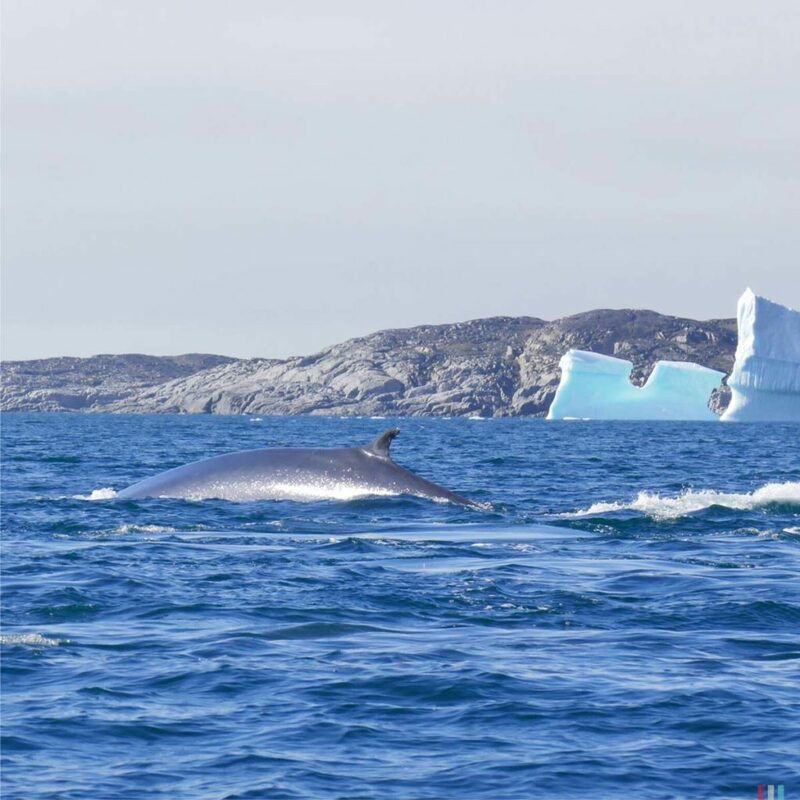 Fin whales are fast swimmers who often zigzag, so it’s challenging to keep up with them. But suddenly they surfaced pretty close to our boat and slowly traveled along for quite a while. Meeting fin whales while sitting in a small zodiac doesn’t worry me at all. They’re much bigger and heavier than humpbacks (up to 25 meters and up to 100 tons), but they hardly ever breach. Given their unbelievable size they don’t have any energy to waste. So, we joined the fin whales for a while. Later, a few humpbacks came along, too. They stayed in safe distance and didn’t breach. The Disko Bay is located above the Arctic Circle. During summer you have 24 hours of daylight. What remains, however, is the thing with the narwals. Where do we have to go to meet those mystical unicorns of the sea? And when? Back in the harbor we asked for the most mystical of all whales: narwals. Their giant tusk (two meters!) gave them the nickname »unicorns of the sea«. In opposite to the fairy tale unicorns, narwals are real. The really live! Namely somewhere here! But narwals are extremely shy und always stick close to the ice edge which is not among the most accessible places in the world. The National Geographic photographer Paul Nicklen once had even built his own ultralight plane and spent weeks in the Arctic to finally find narwals. Incredible pictures, truly worth the effort.